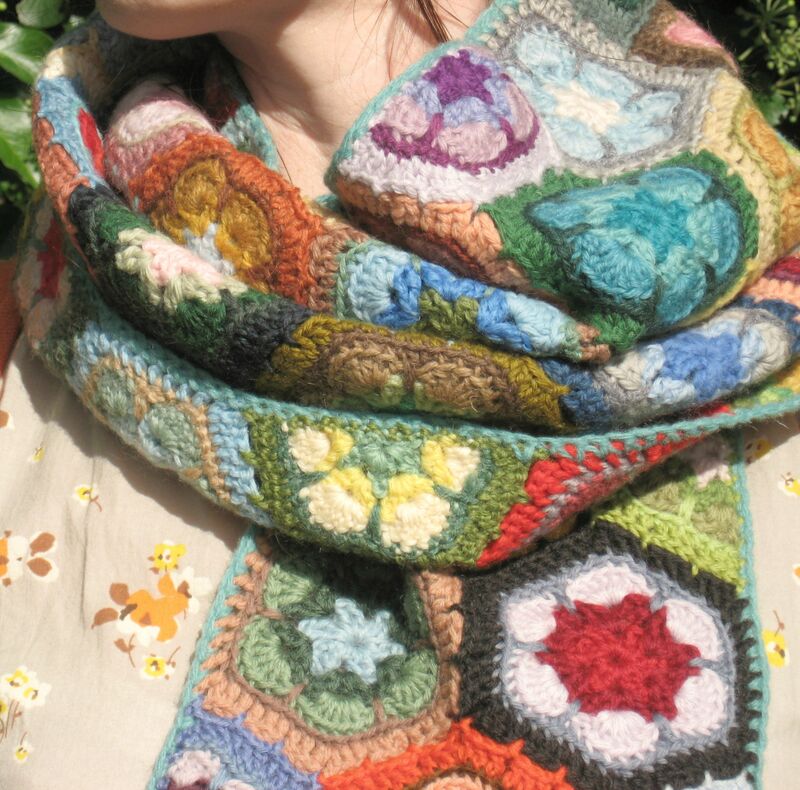 Wintry skies and a rainbow hoard of woolly treasure………. 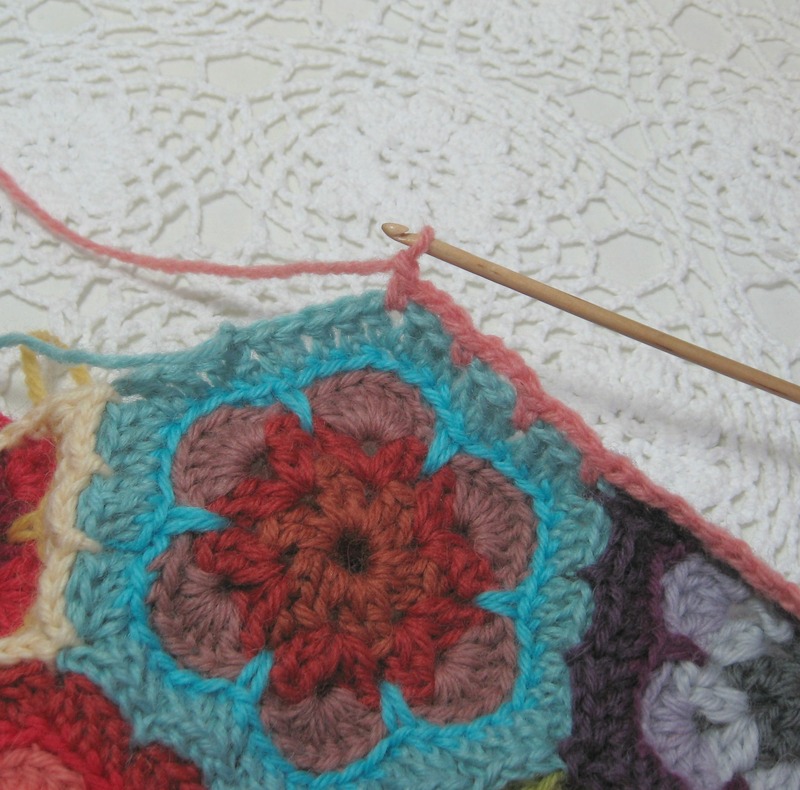 It’s really horrid weather outside today, cold, wet and windy….I’ve been desperately hoping for a proper flurry of snow, and keep looking out the window as it’s that odd and eerie light you get just before snow begins to fall….. anyway while I’m sitting here keeping my fingers crossed I’m drinking tea and sorting out a big hoard of tapestry wools I bought recently. 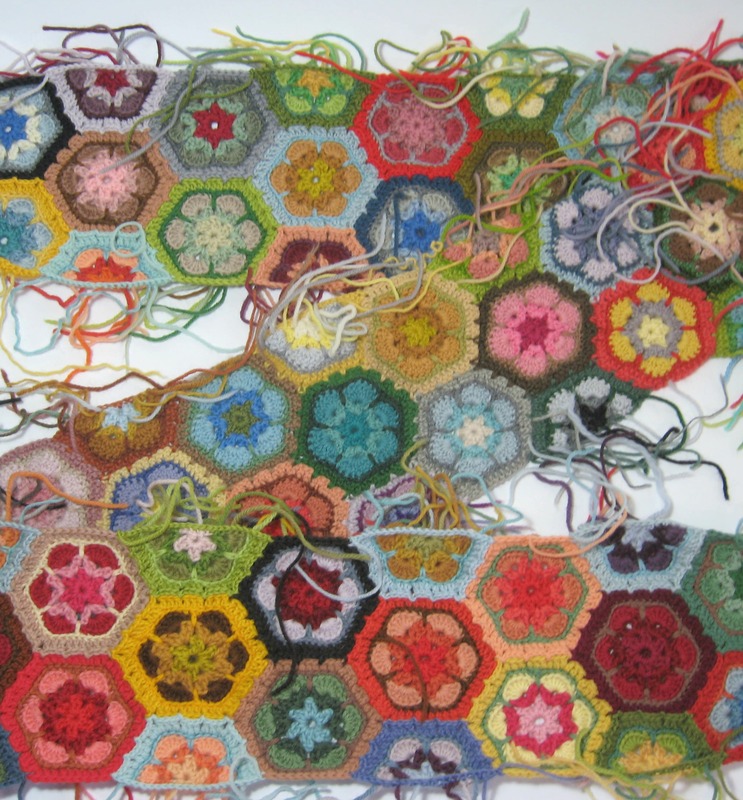 Having the wool tumble out all over the work table feels like a burst of Summer sunshine and I’m taken back to the warmer months when I was sewing brightly coloured patchwork for “dear ethel” and eating sticky ices and sorbets…. 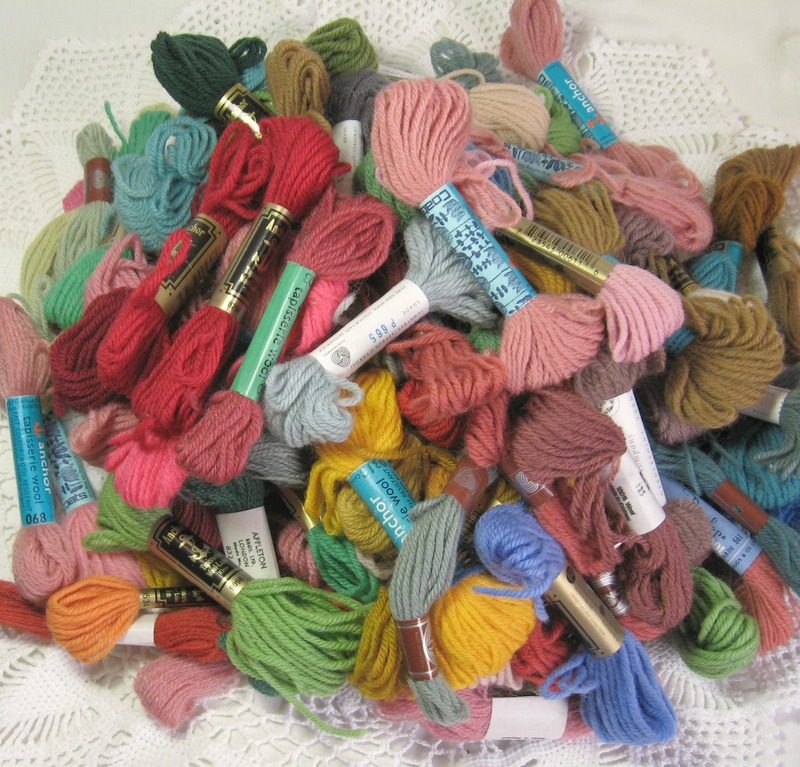 This was all from a fantastic and brightly hued assortment, and is a mix of both tapestry and crewel wool from a variety of different brands……old favourites such as DMC, Anchor (both gold label and the lovely vintage blue label), Appleton, Penelope (possibly my favourite after Elsa Williams, the colours are so soft and gentle and just lovely to work with)…and there was a new brand for me, Rowan wool for tapestry which I’ve not used before (most of the tapestry wool I use is second hand, be it jumble sale, car booty, charity shop or ebayed…….. 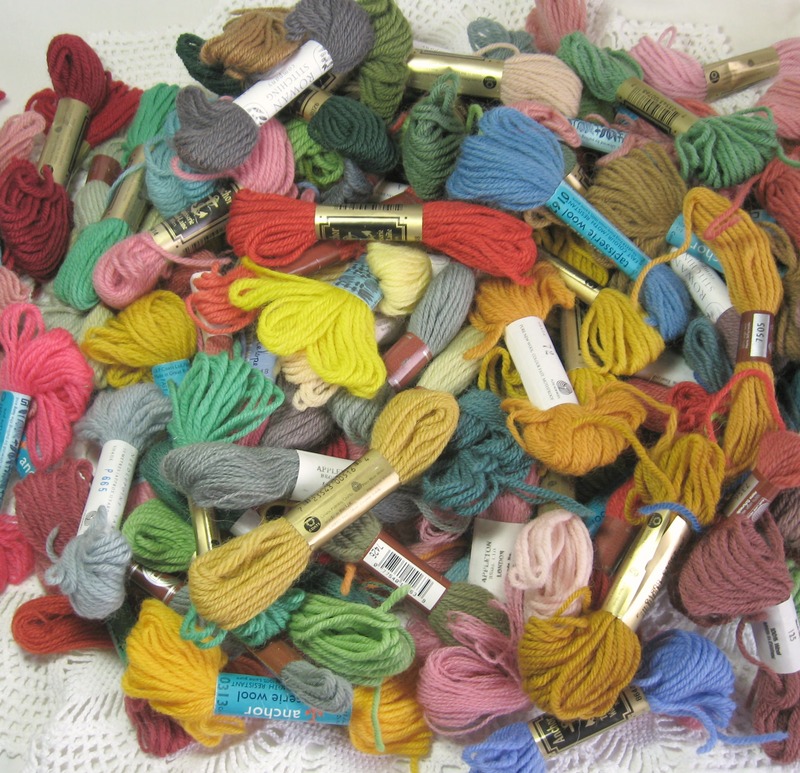 This hoard of woolly treasure all came from the St Gregory’s Antique centre in Norwich….there is a lady there called Jenny who has a lovely haberdashery stall and rare is the visit when I’ve popped in and not come away with something, be it Dewhurst Sylko threads, embroidery silks, packets of Kirby or Princess Victoria needles, super sharp embroidery scissors, delightful old cotton prints perfect for patchwork…….it’s a real treat having a rummage around her stall and I was in seventh heaven when I found these wools. 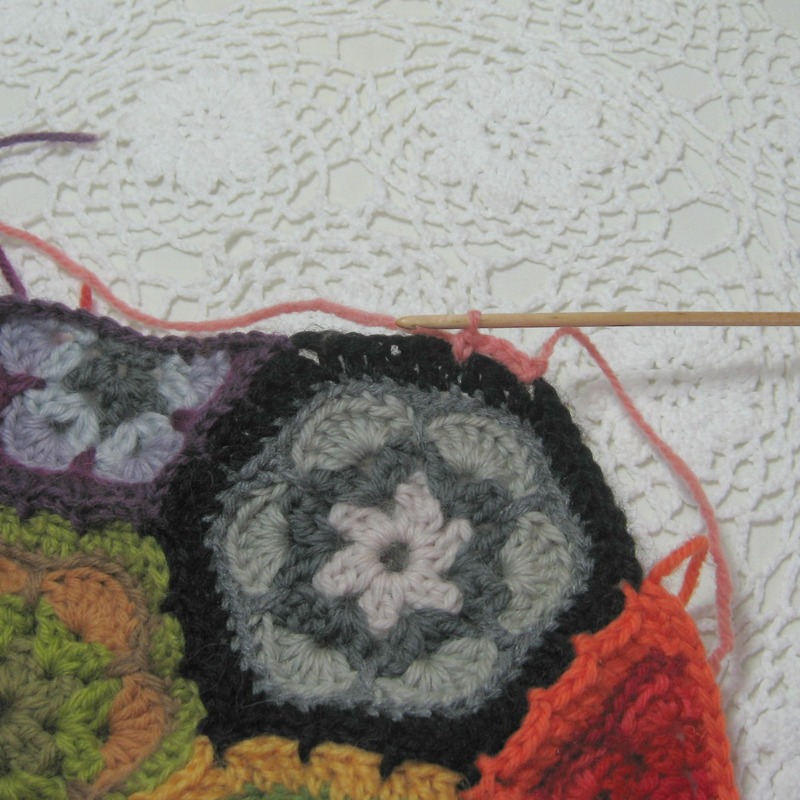 Most of the tapestry wool is intended for new projects made using my favourite crochet pattern , and the crewel wools are for various embroideries. 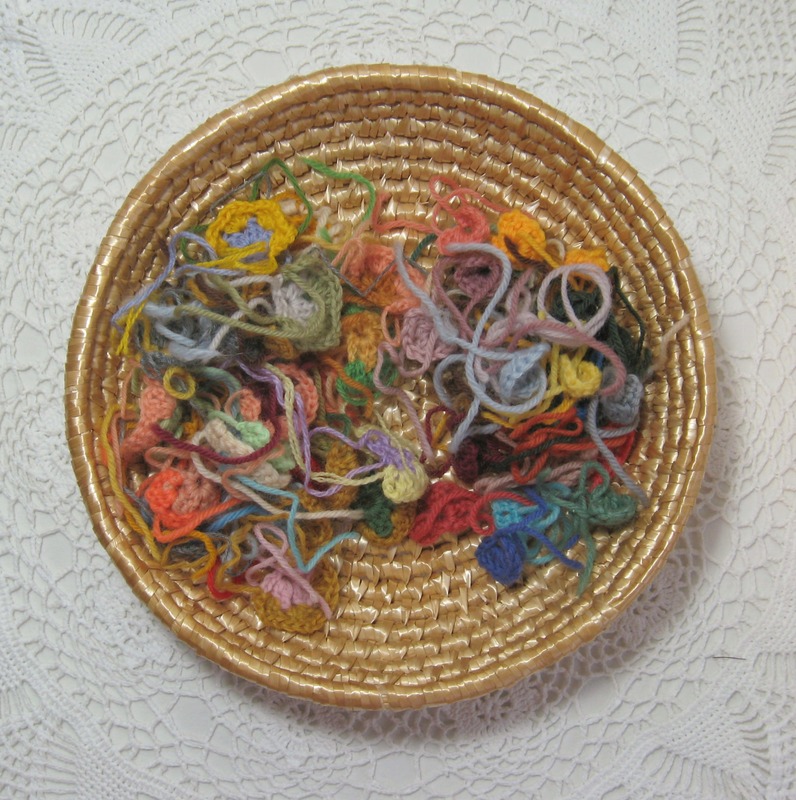 Short lengths of tapestry wool left over from my crochet are bundled up into tiny doll sized skeins and are saved for embroidery testing…they also come in handy if I’m embroidering banks and swathes of flowers and want the variety of colour they’ll give. 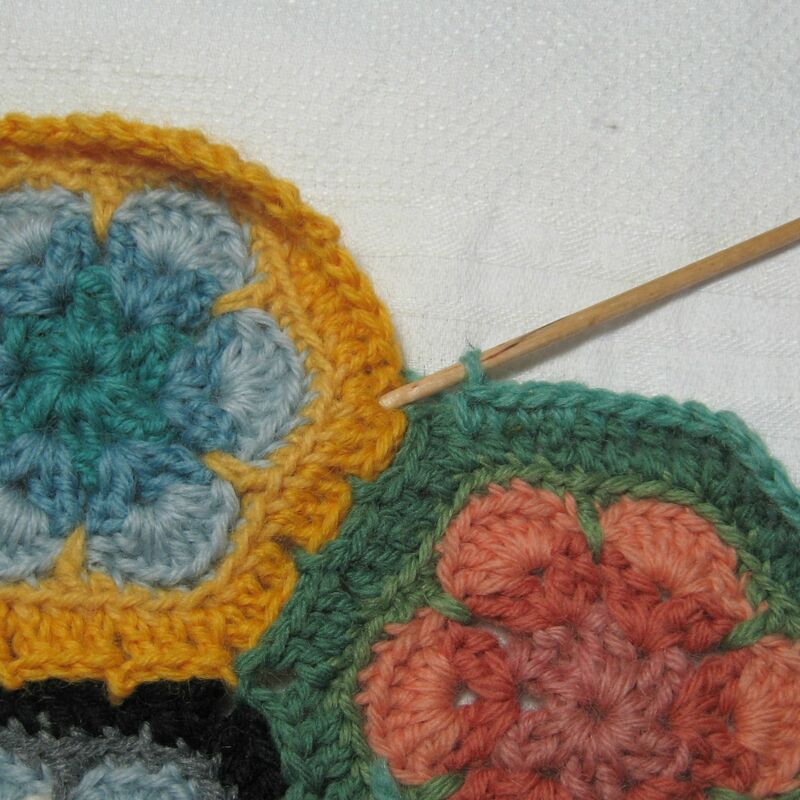 One of the main reasons I like crocheting with tapestry wool is that they come in such a wonderful and varied choice of colour….subtle and gentle variations in hue and tone really allow the crochet (or embroidery) to pulsate and glow. 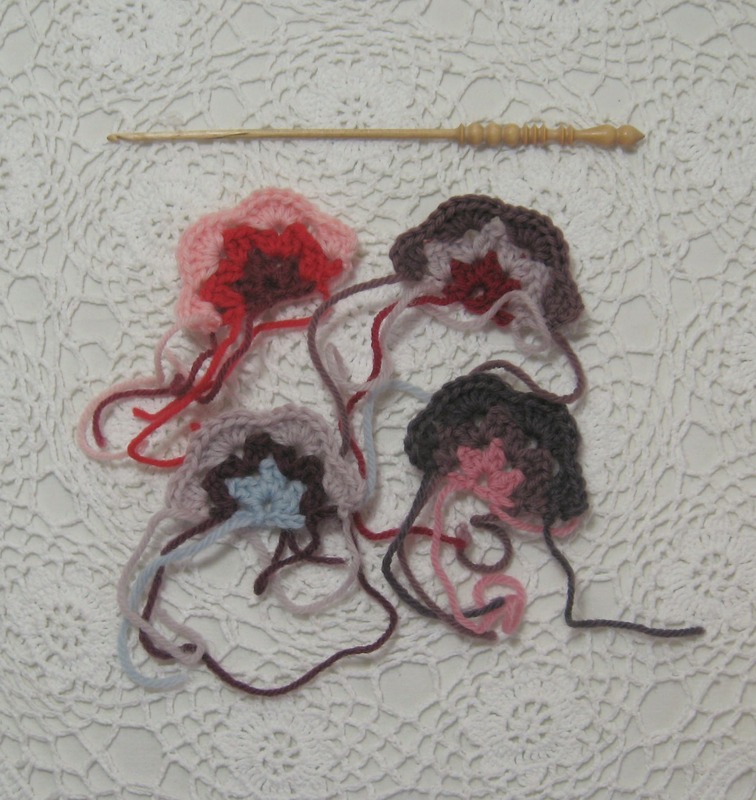 None of these three reds was a particular bright orangey red, instead they were all a deep bluey red, similar in colour but when placed together you could really see the difference in colour. 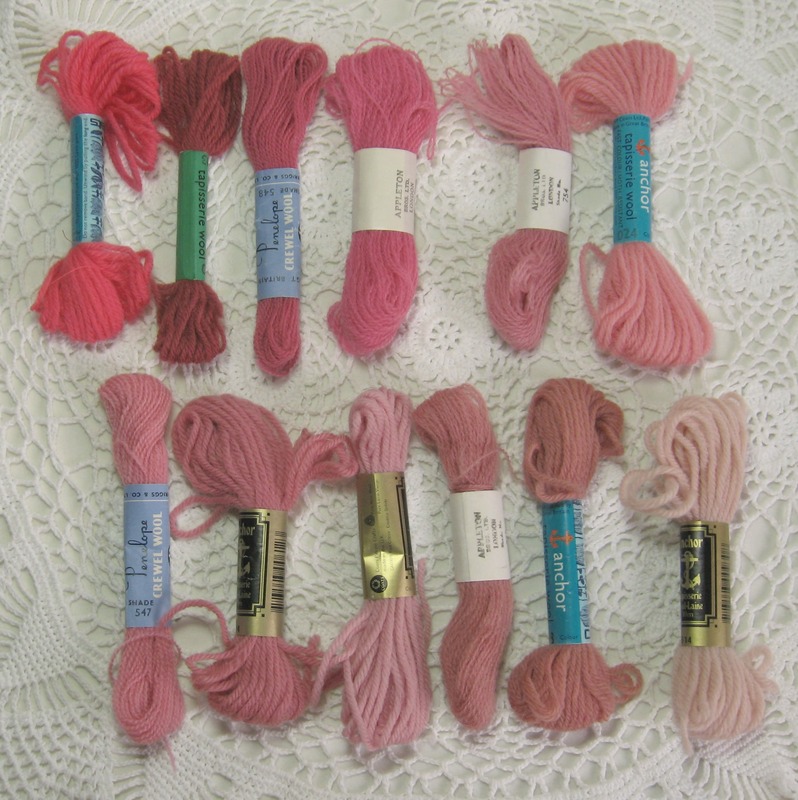 Pink pink pink, light and delicate rose pink, bright sticky summer lolly pink, dusty rose and hubba bubba bumble gum shades……I had a few doubles but when separated out there were 12 different shades. 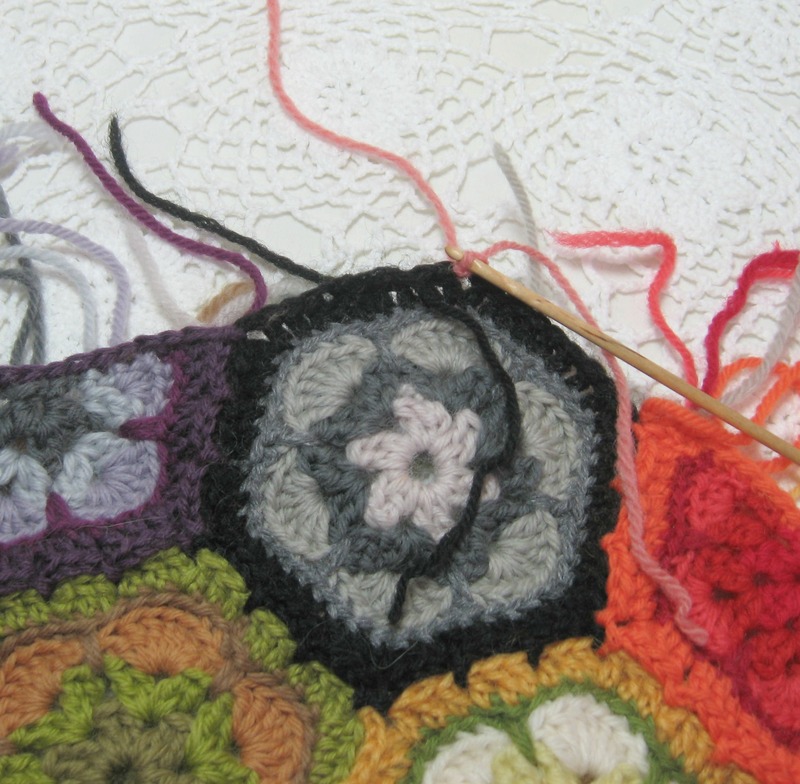 When I’m embroidering I try to save the crewel wool for more delicate stitches and for working on top of more intense areas of stitching. 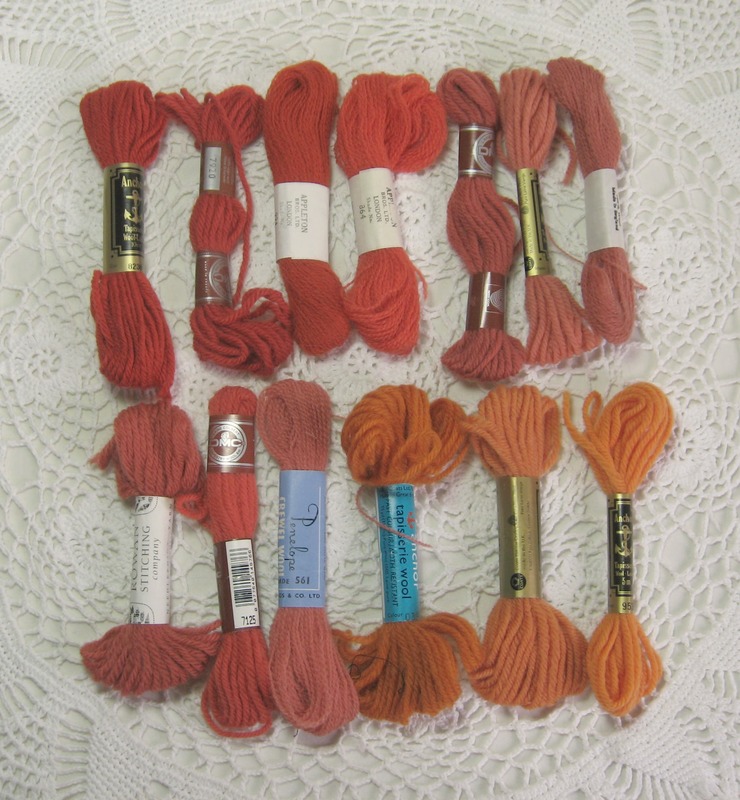 From bright marmalades and soft drink cordials, to autumn leaf hues and almost pomegranate tones…13 different shades of orange wool, mostly tapestry weight but couple of crewel wool. 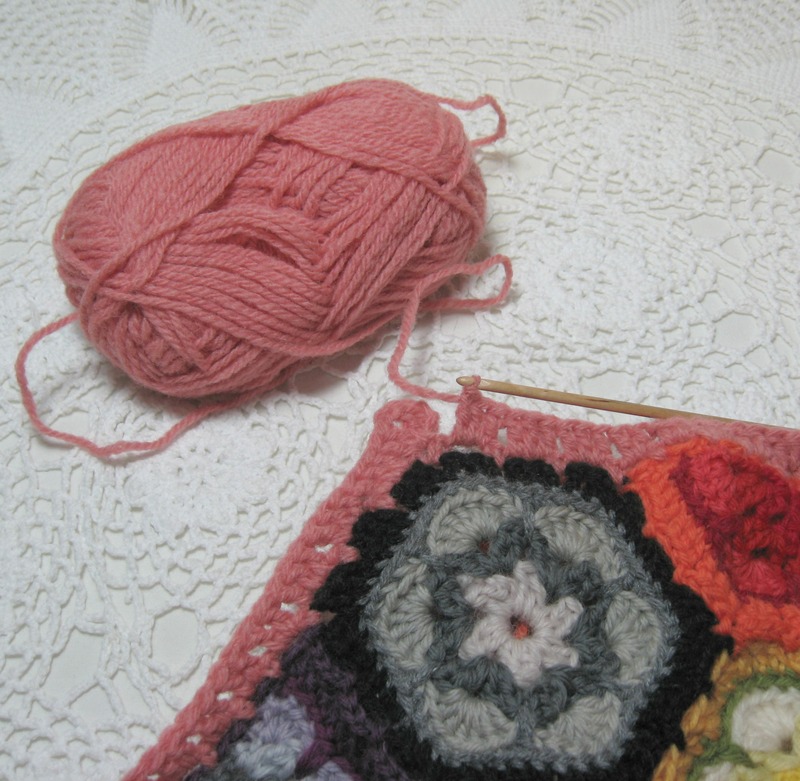 I don’t use a lot of orange but when I do I love mixing it with grey or blue…and every so often I like a red pink orange combination (I’ll happily wear these colours together and am planning a new scarf in this combination). 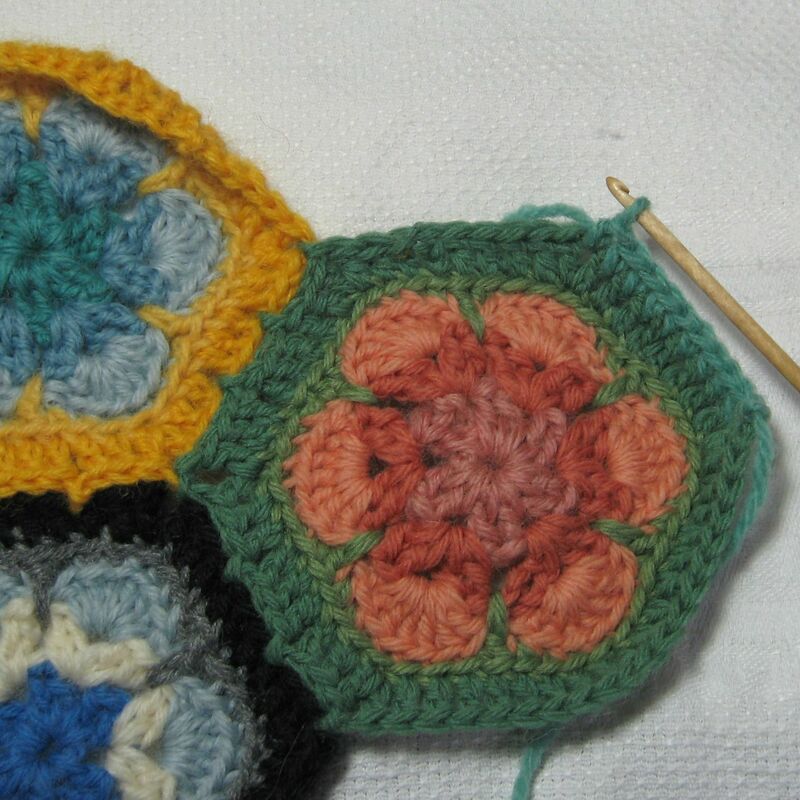 One of my favourite colours for crochet is yellow, firstly there is such a wide range of this lovely smile inducing colour, from soft and delicate primrose and cowslip yellow, to bright lemon peel, then goldenrod, mustard, saffron and straw yellows…… it mixes well with every colour, blues, greens, reds and brown all combine beautifully, but it also works well with purple shades, soft lavenders and lilacs….a few of the hexagon flowers I made for the blanket are in this yellow and purple pairing and look like giant pansies. 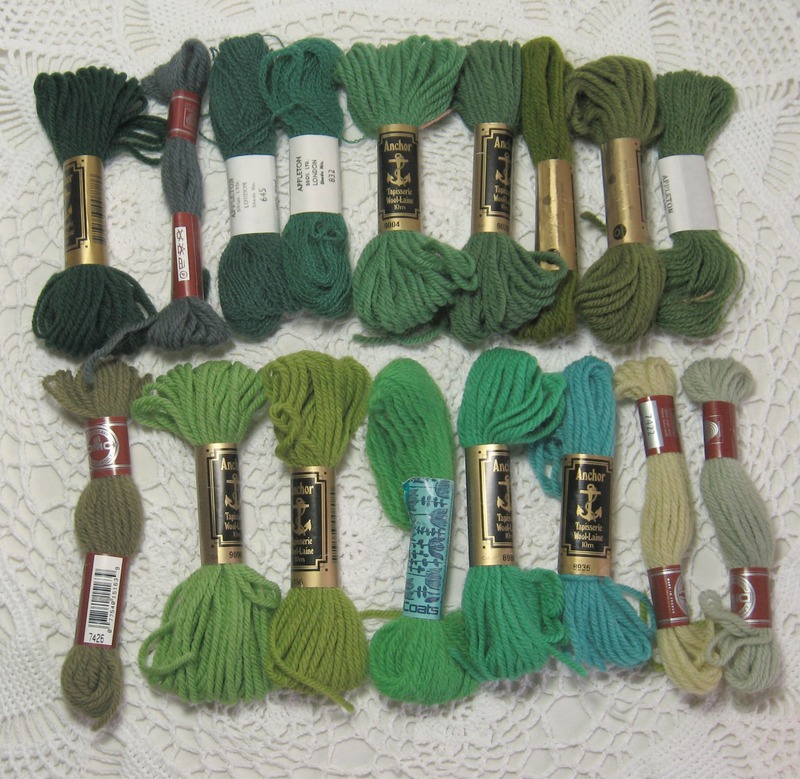 There was quite an abundance of green, 17 different shades in all…..the one that is third from the right on the bottom right looks more blue in the picture, but when placed next to the blues it’s definitely green….one of those in-between shades that blends well with colours either side. 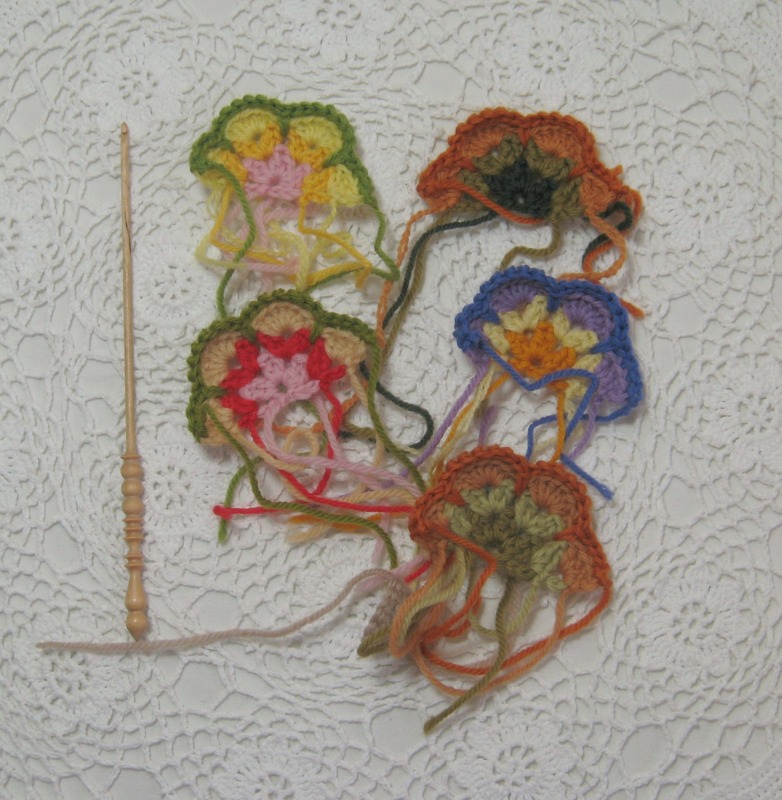 Most of the green wool was tapestry wool but there were a few skeins of crewel wool, perfect for embroidering fern and feather stitch. 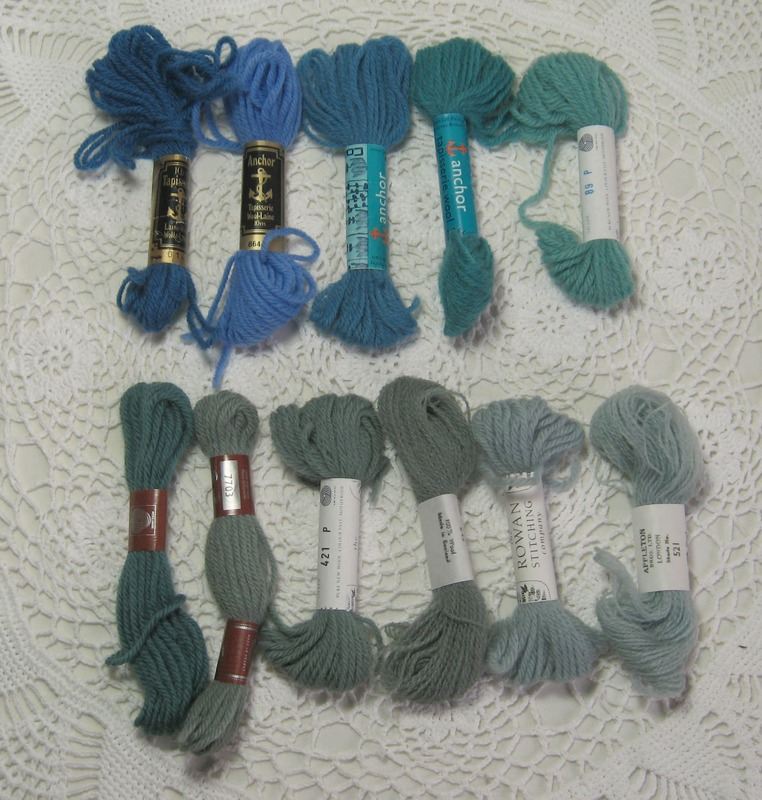 Not so many blue shades in the mix, mostly soft muted tones more towards the grey end of blue……I’ve found when I use anything too bright (ultamarine type blues) they overpower somewhat so these gentler shades fit in very well with the palette I tend to work in. 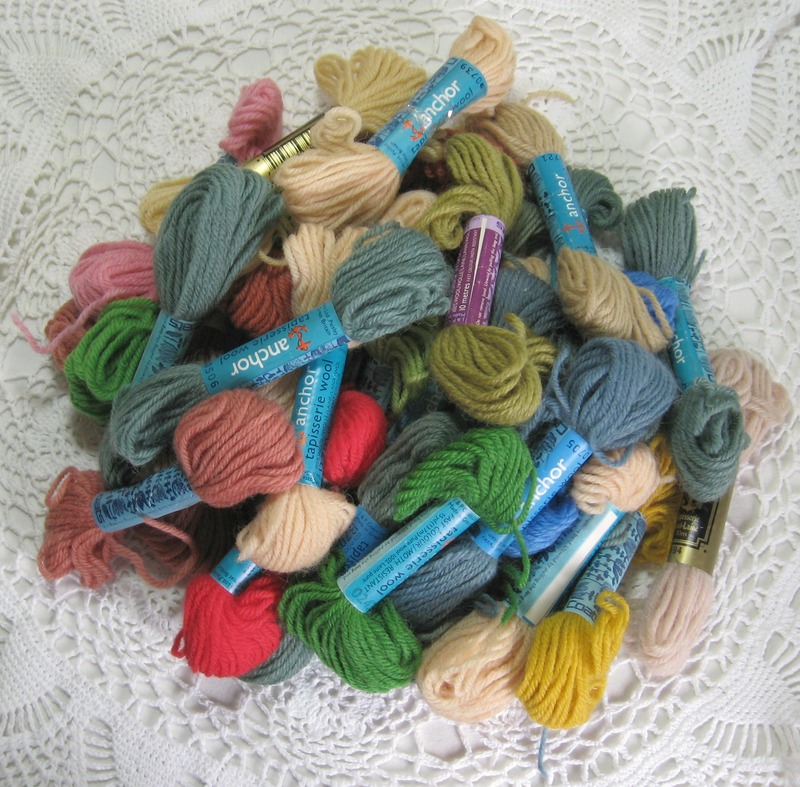 Along with these blues there were also a couple of just the most perfect barely turquoise blue in crewel wool which had fell on the floor when I emptied out the wool onto the table. 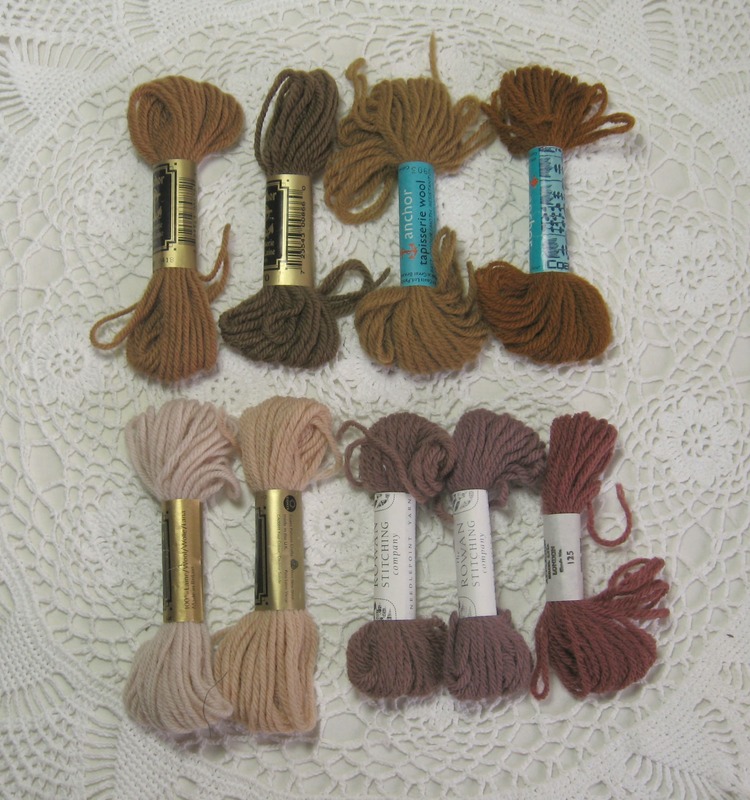 Finally 10 shades of brown, 2 of which are soft and beautiful hues by Rowan…..there is something so gentle and appealing about these particular shades that makes me think of beautiful hand knitted jumpers and cardigans in the Rowan catalogues. 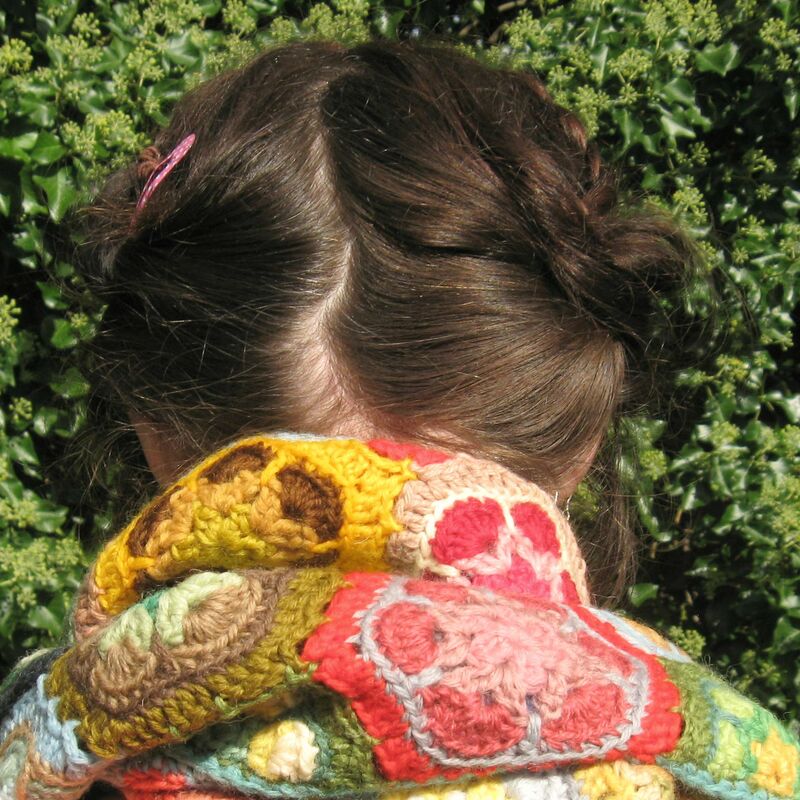 They are very mushroomy and wild, very organic. 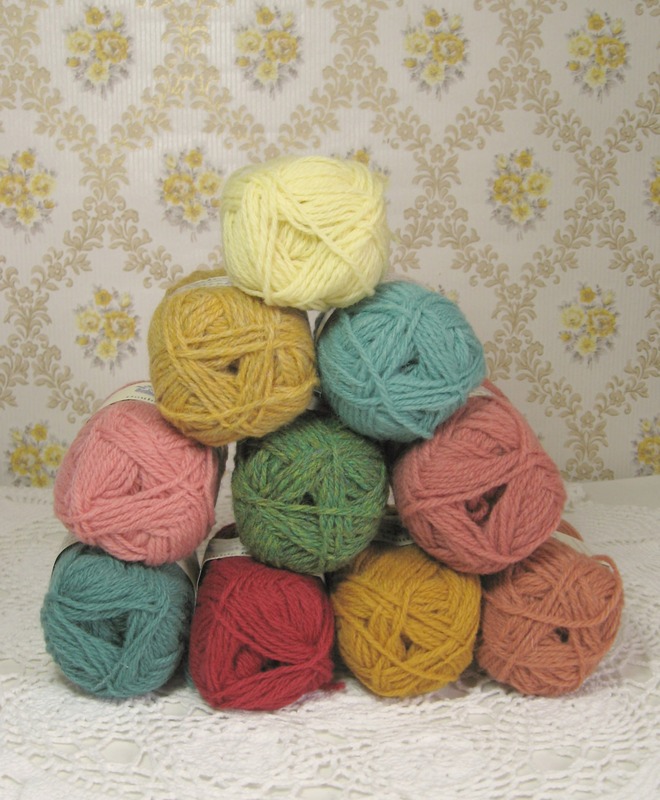 I had a quick sort through my boxes and bags of wool and I haven’t been able to find anything quite the same so they are obviously very much a Rowan colour. 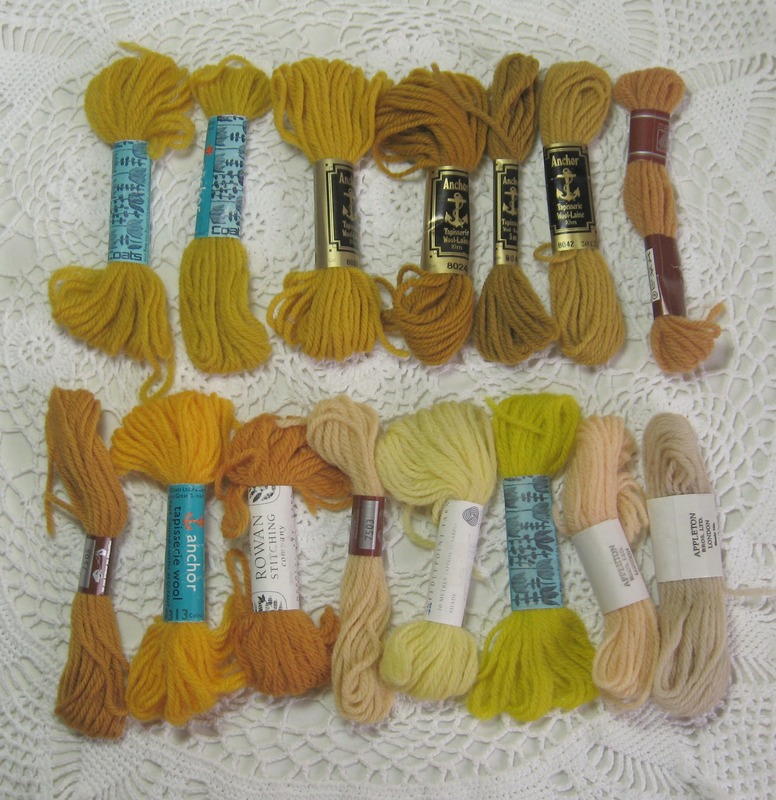 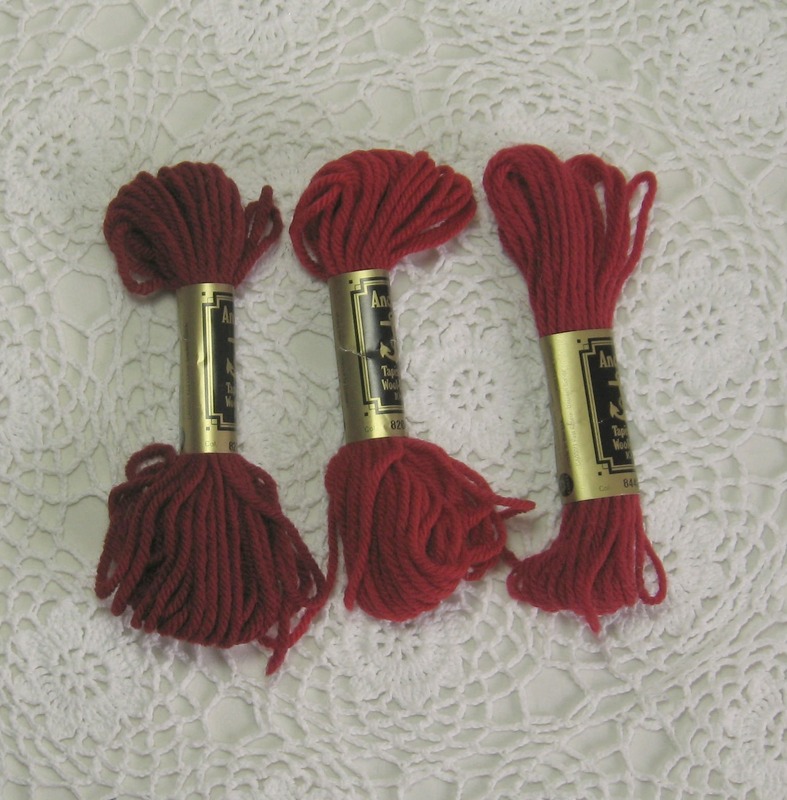 In all there were just over 100 skeins of tapestry and crewel wool, with maybe a handful or so of doubles and triples….some hues crop up a lot, I think they’re in tapestry kits as a background colour as they always appear in big quantities. 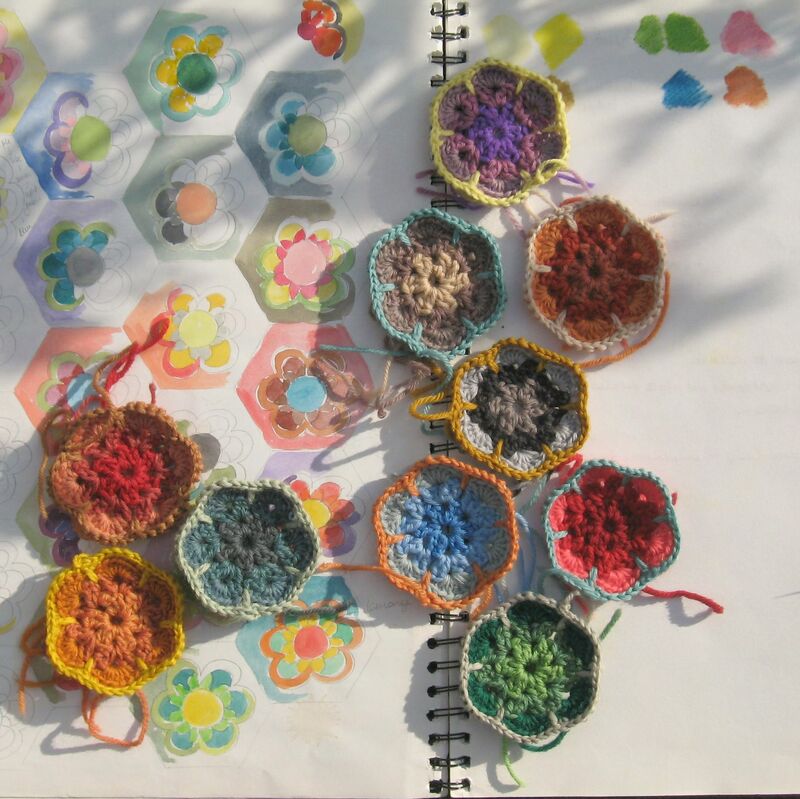 However using them with other colours and varying the hues around them can make them appear quite different even when placed near to each other. 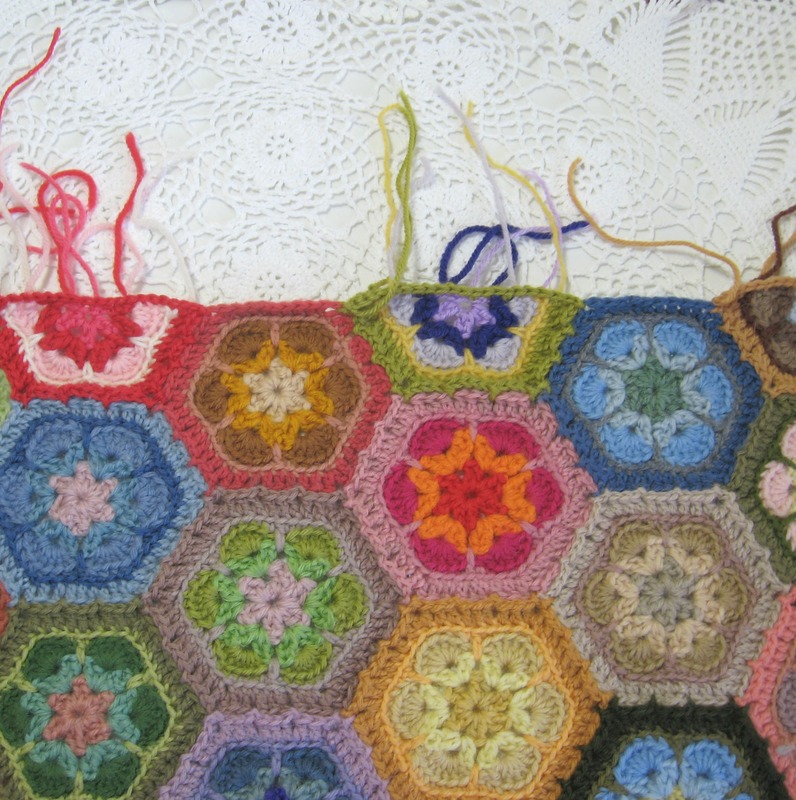 I’ve been re-reading more of the fantastic Knitsonik book I bought the other week. 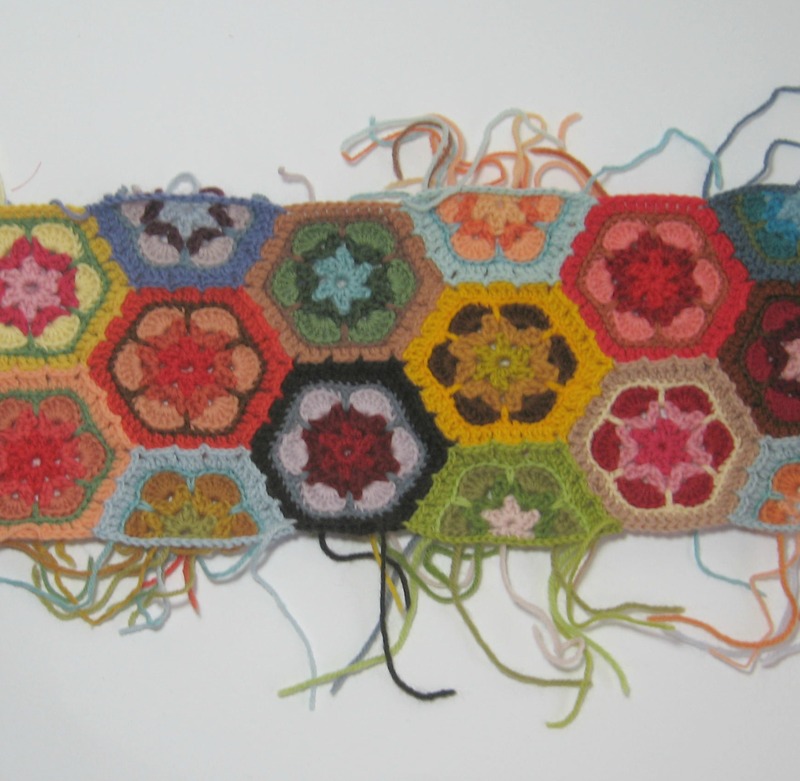 I can’t recommend it highly enough, Felicity’s writing about colour theory and colour choice is so easy to understand. 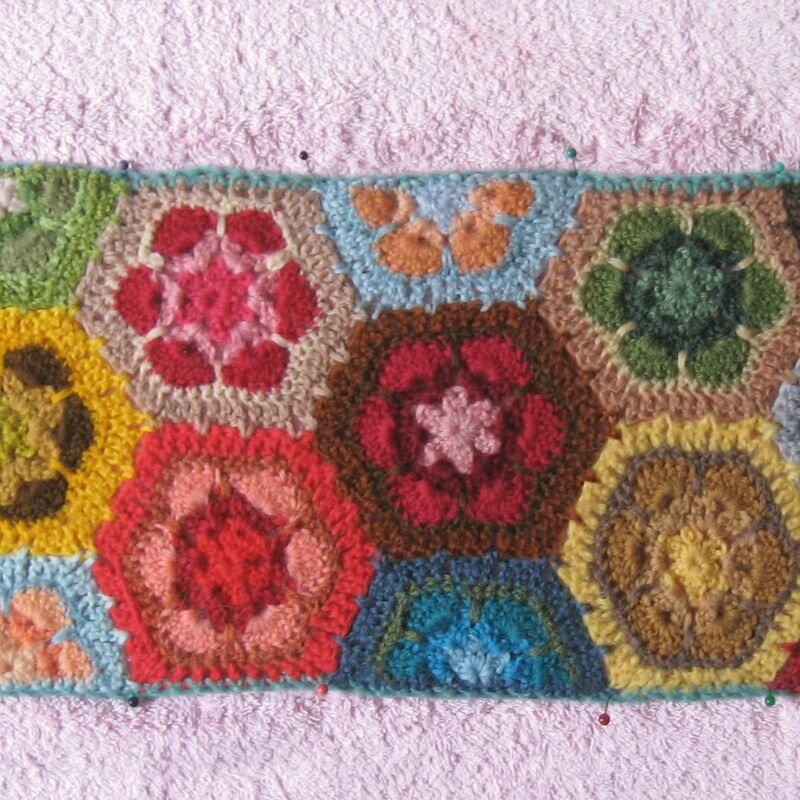 I wanted my grannies paperweight blanket to combine every single colour that was available to me, however I appreciate this isn’t everyone’s cup of tea. 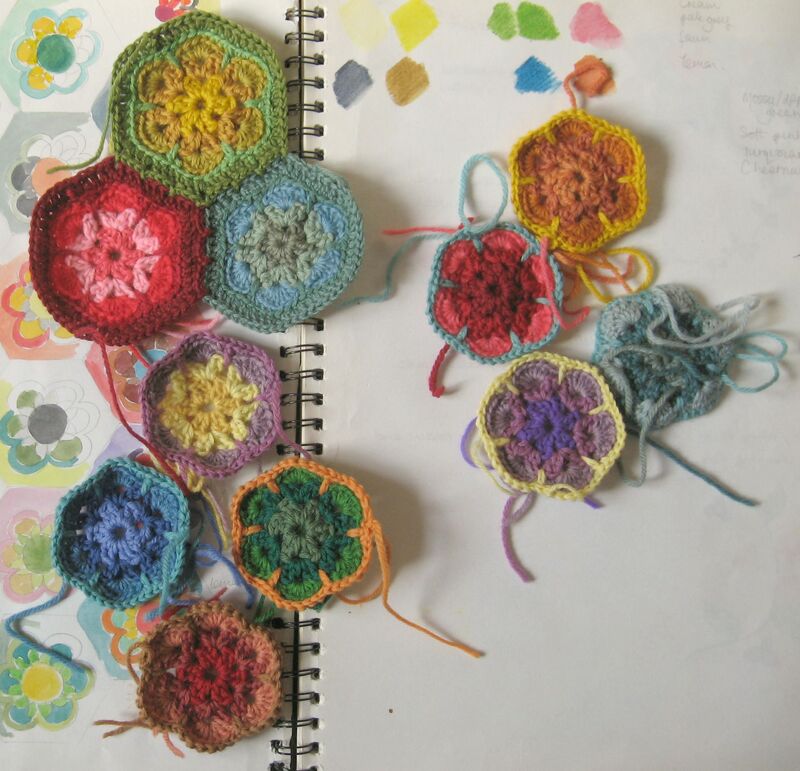 If you want to work within a tighter palette then I’d suggest giving this book a read to understand how colour compliments and how to pick up certain hues and tones in a particular scheme. 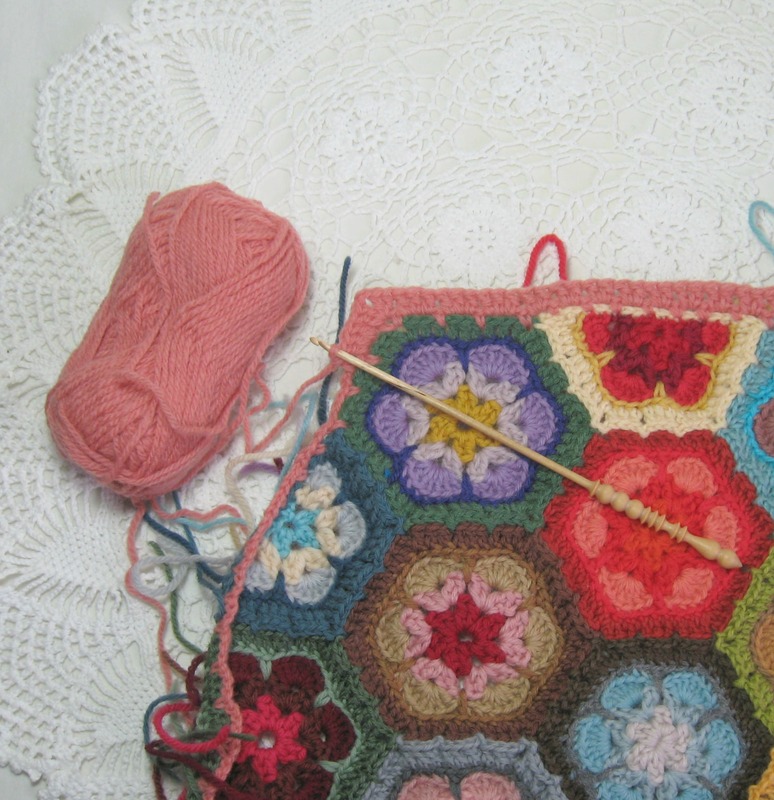 (very useful if you wanted to make a blanket to match a pair of curtains or colours in a favourite tin or book cover….Felicity’s examples are so fantastic….an old factory which is painted pink, a biscuit tin, a lovely vintage book cover are just some of the starting points of inspiration she uses to make her colour choices….) 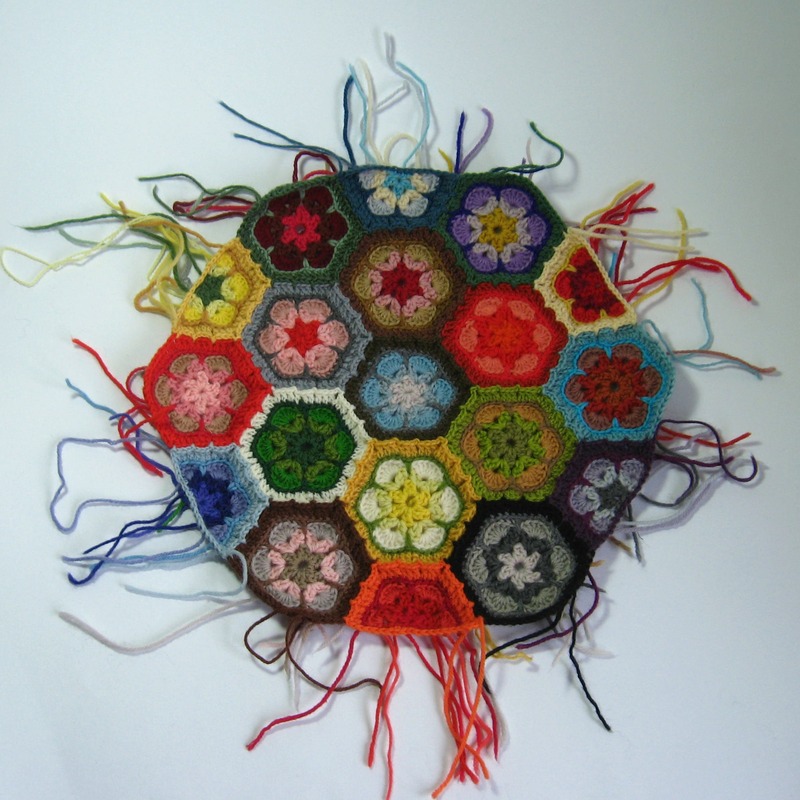 Although it is a knitting book and is intended for stranded knitting, I’m sure if you crochet or are a patchwork sewer then you’d find it just as helpful. 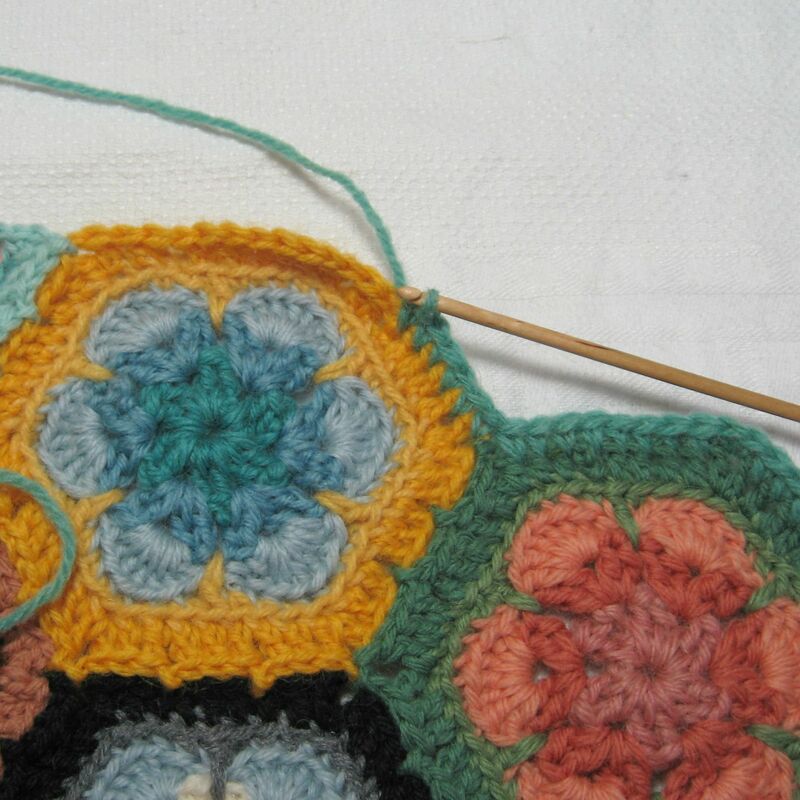 Now off to read some more and make another pot of tea. 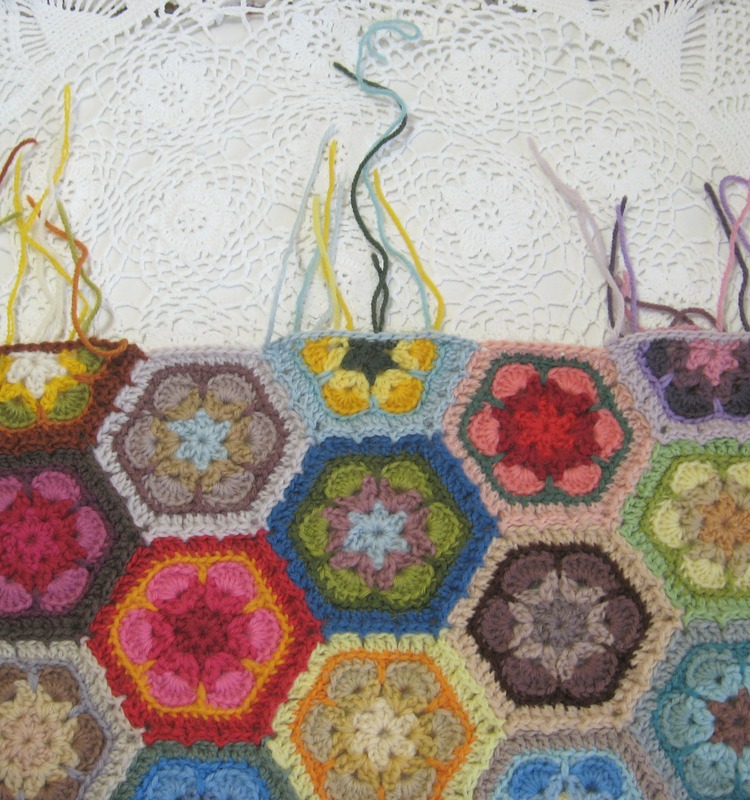 Before sewing a back section to the millefiori cushion, you need’ll to build up a short section of edging around the joined hexagons. 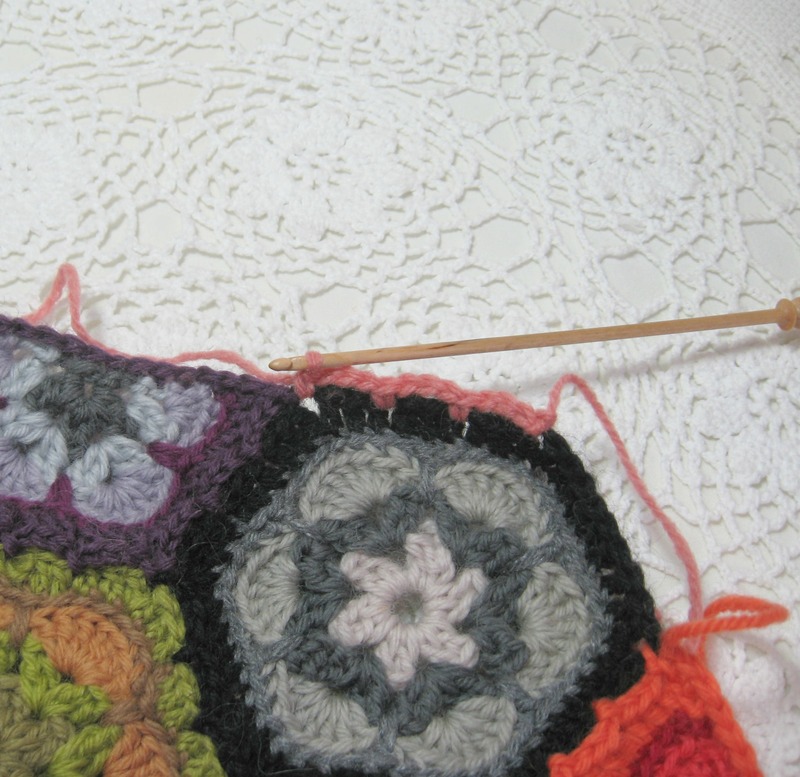 For my cushions, I’ve used some double knit wool from Jamieson’s of Shetland, as that has a nice texture and is quite thick. 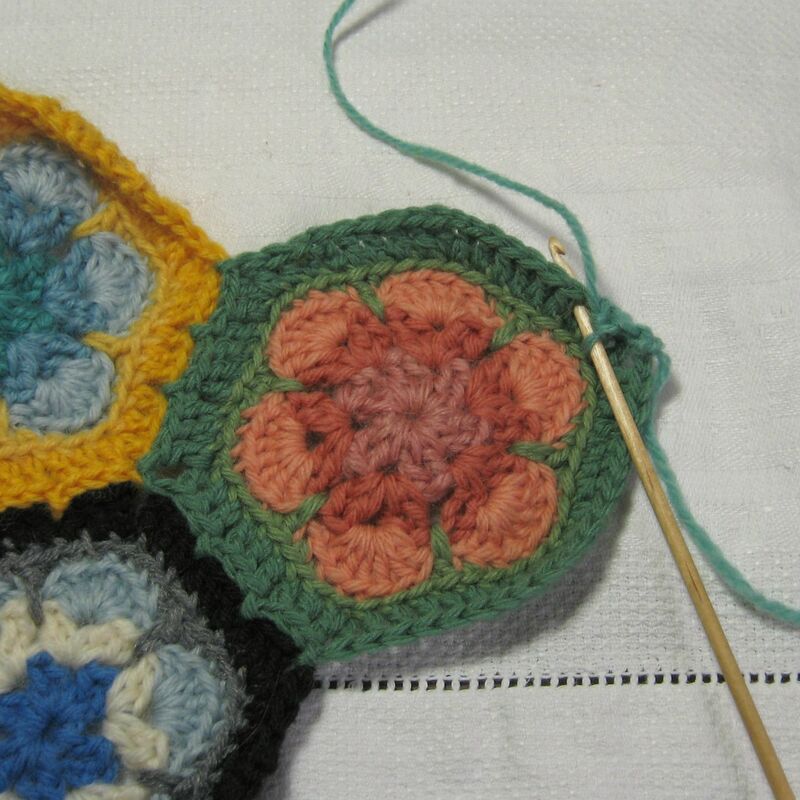 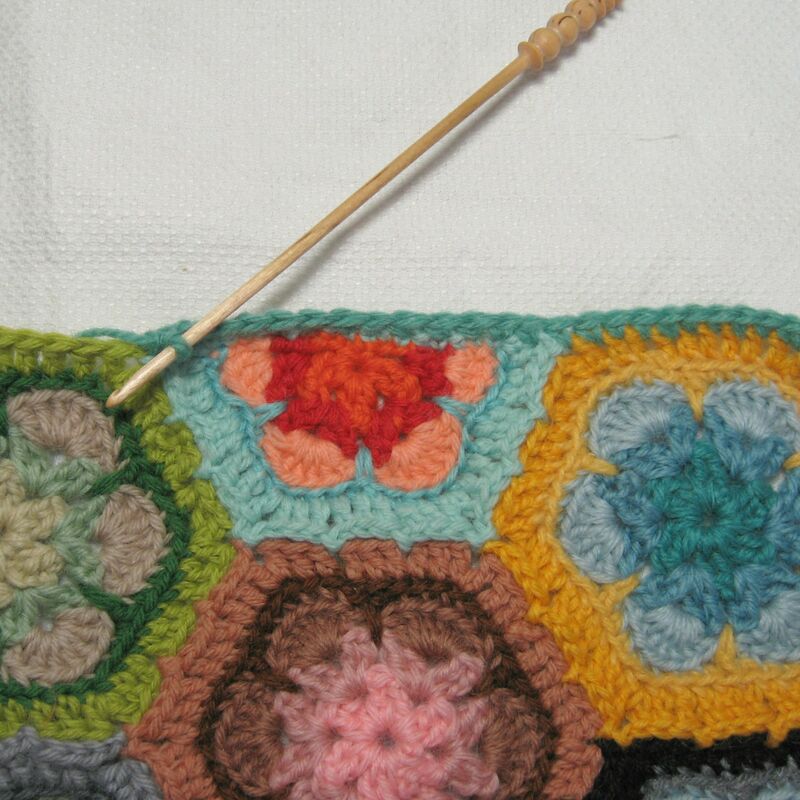 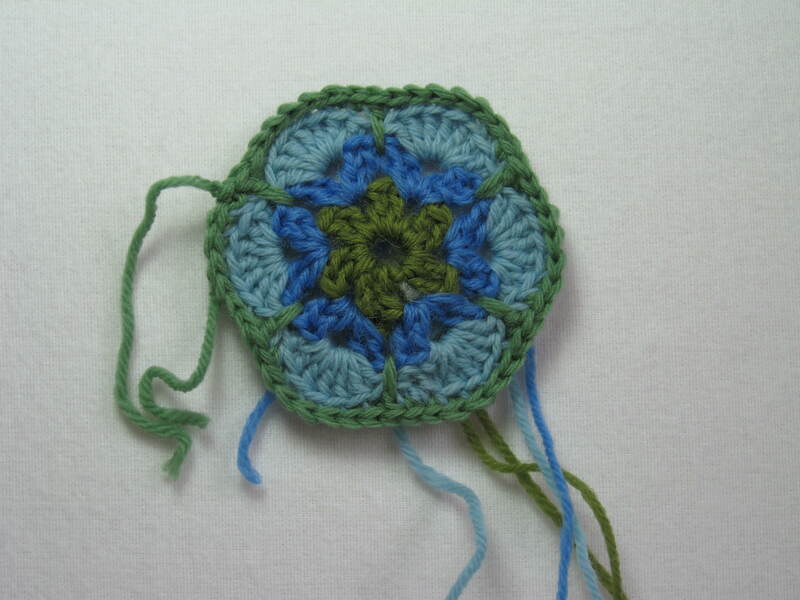 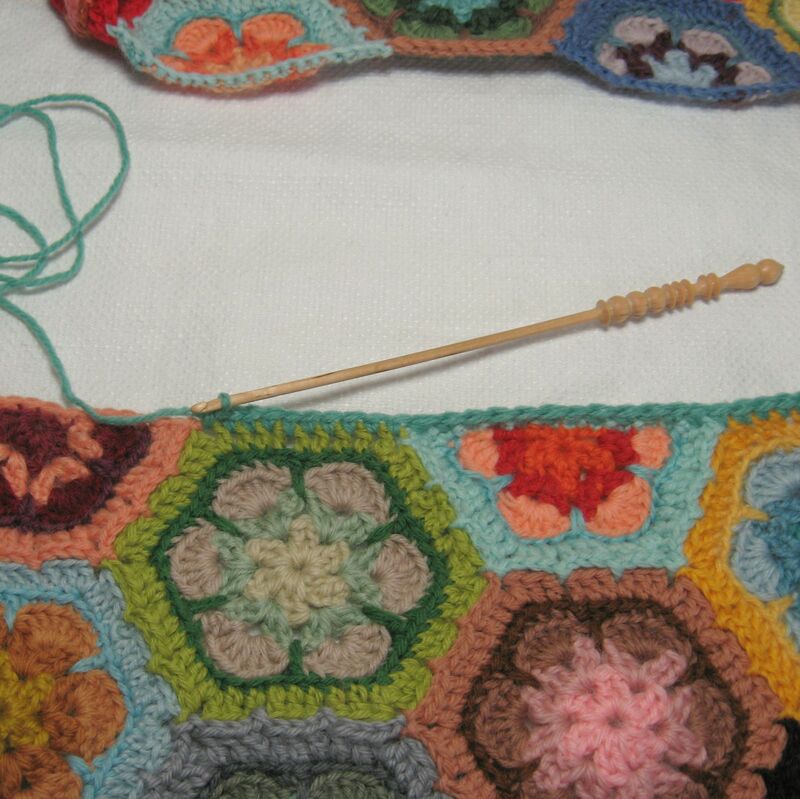 Start by making a slip knot, insert your hook and join through one of the corner gaps of your crochet. 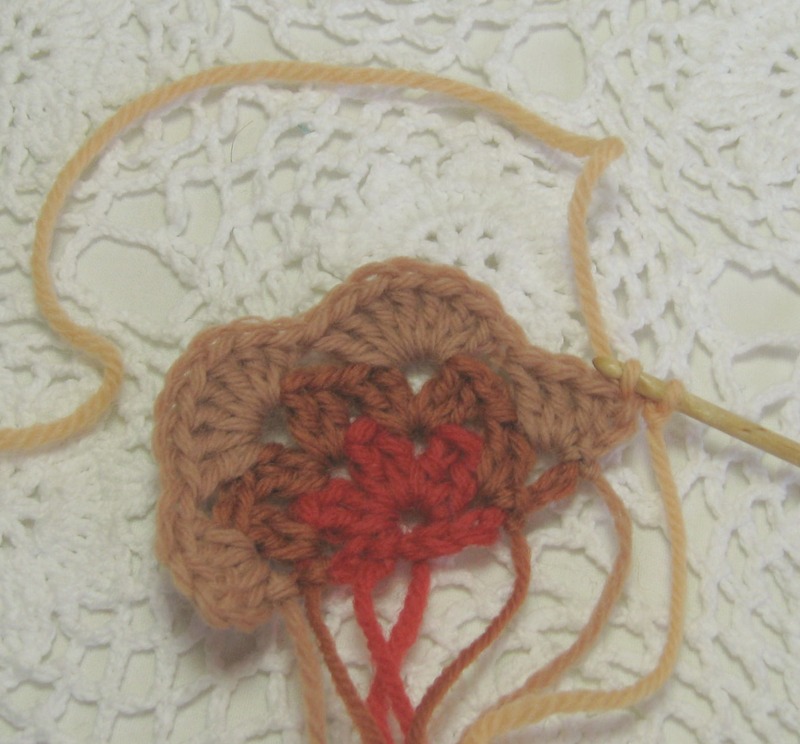 Make a single crochet stitch to secure the wool into position…….chain 3 and count along 3 of the double crochet stitches, insert the hook between the 3rd and 4th double crochet stitches and make a single crochet stitch. 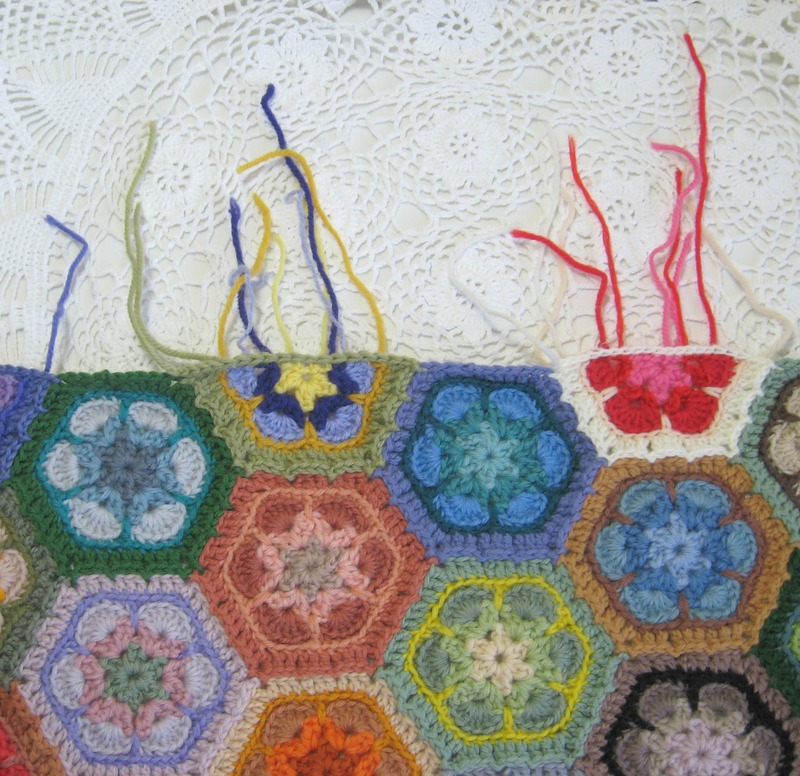 Make another 2 sets of 3 chains until you reach where the whole hexagon joins the half hexagon, make the single crochet before beginning to work along the edge of the half hexagon…..
Now rather than make a chain of 3, I find making chains of 2 seem to sit better on the half hexagons. 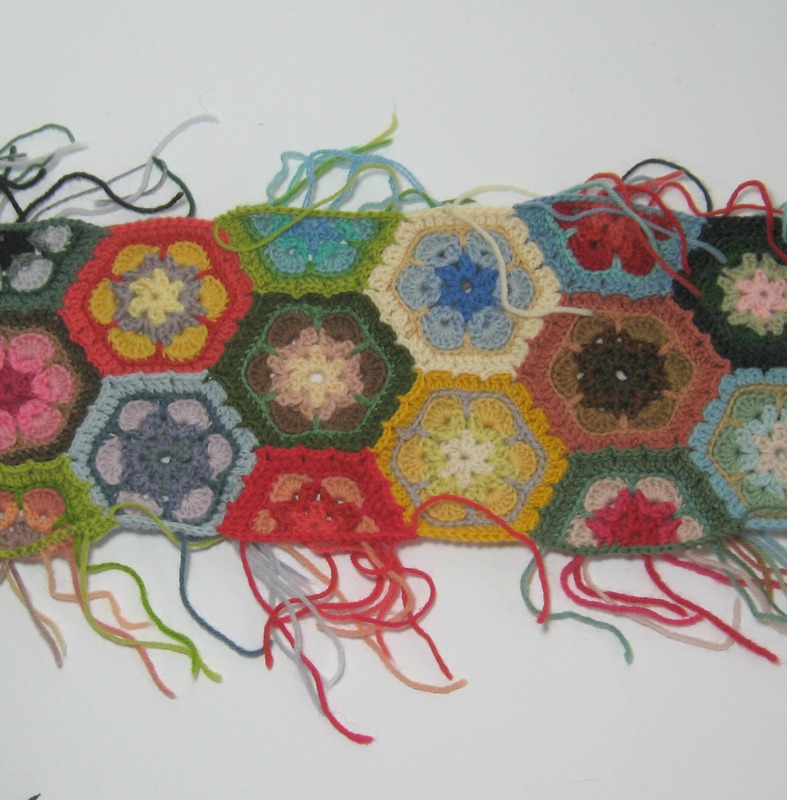 I join them in every 2 or 3 chains along (if you click the picture it will come up nice and big and you can see better what I’m trying to explain). 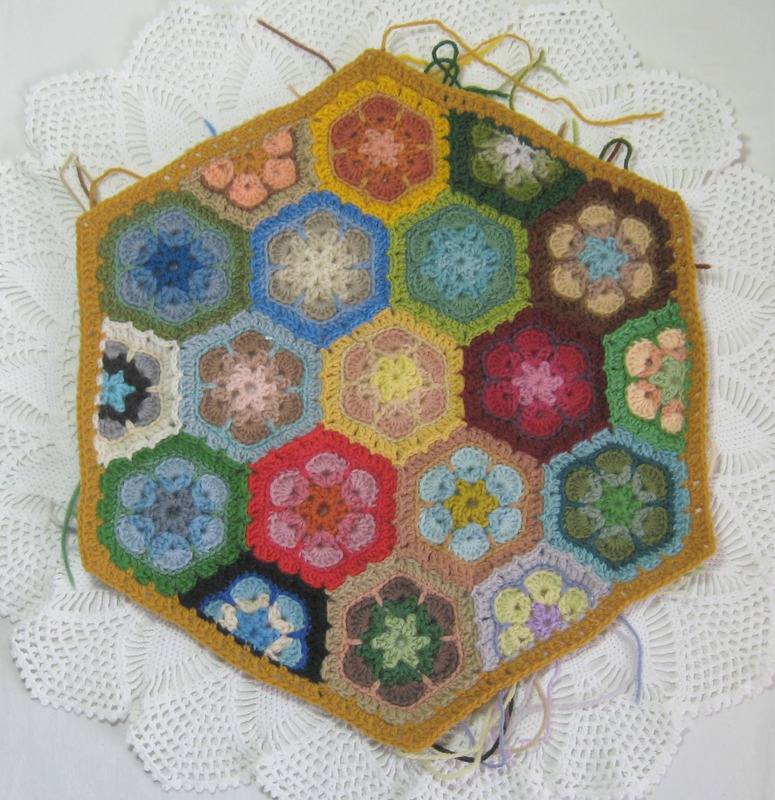 In total you need 8 loops along the half hexagon. 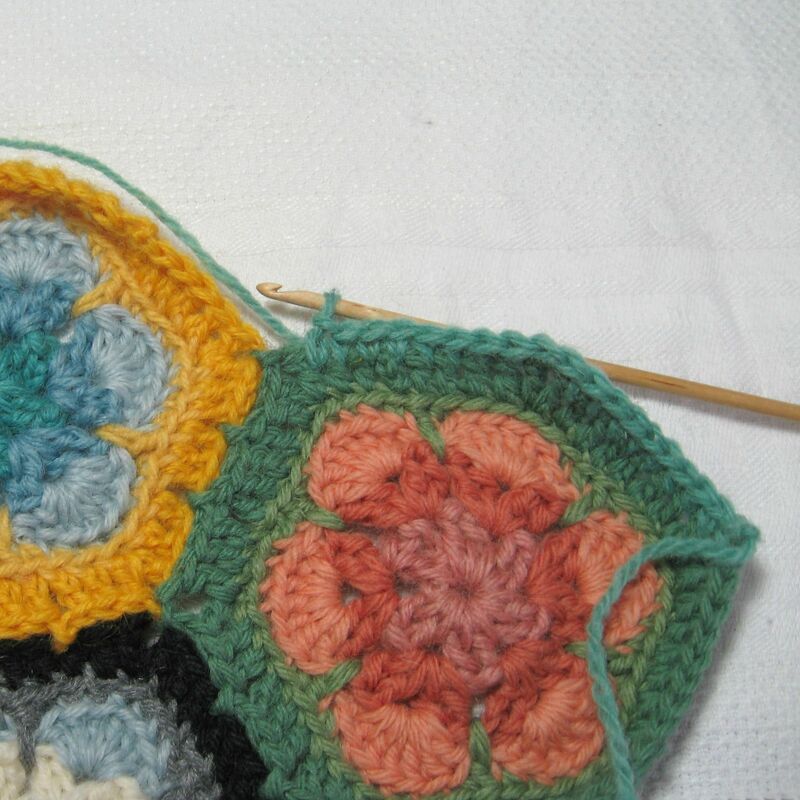 Working 2 chains also helps to keep the half hexagon sit flat rather than bulging out a bit. 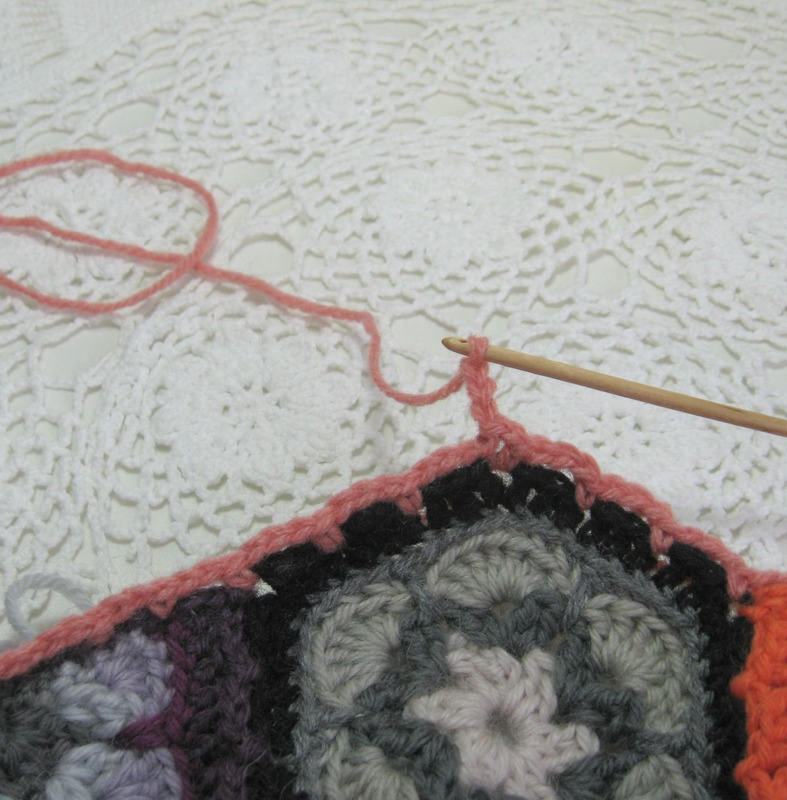 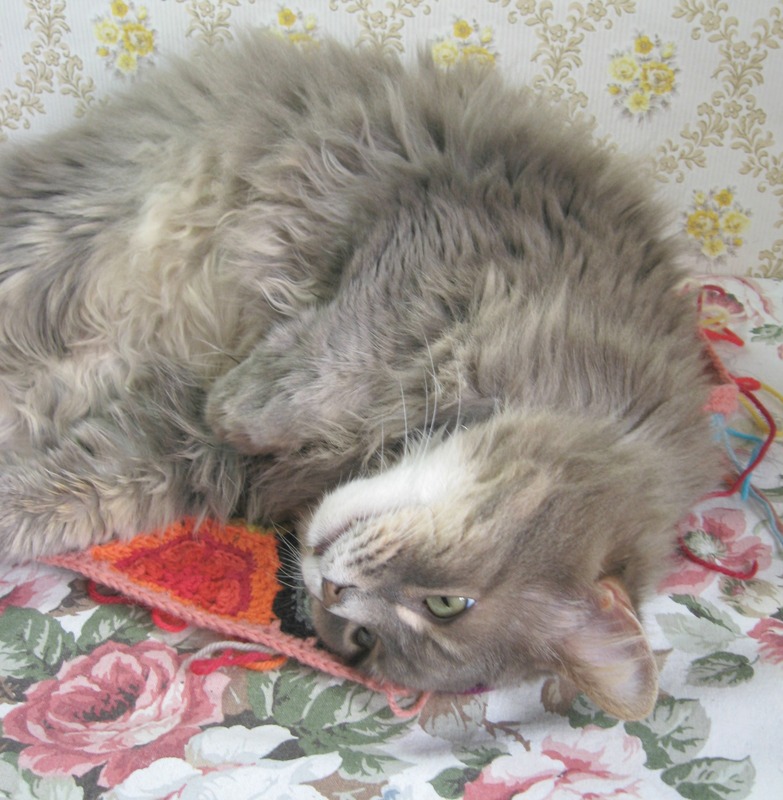 When you get to the next corner gap, make a single crochet stitch…. 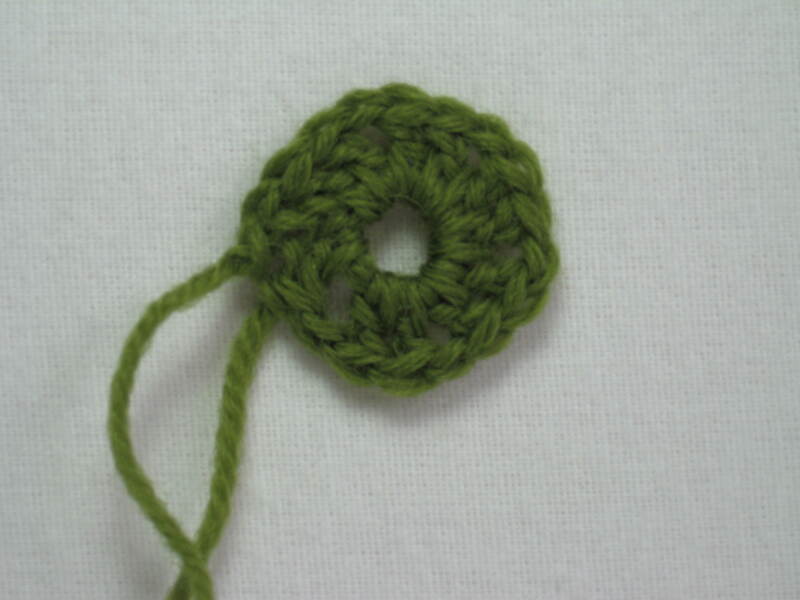 Make one chain and then work another single crochet stitch and work it back into the corner gap…. 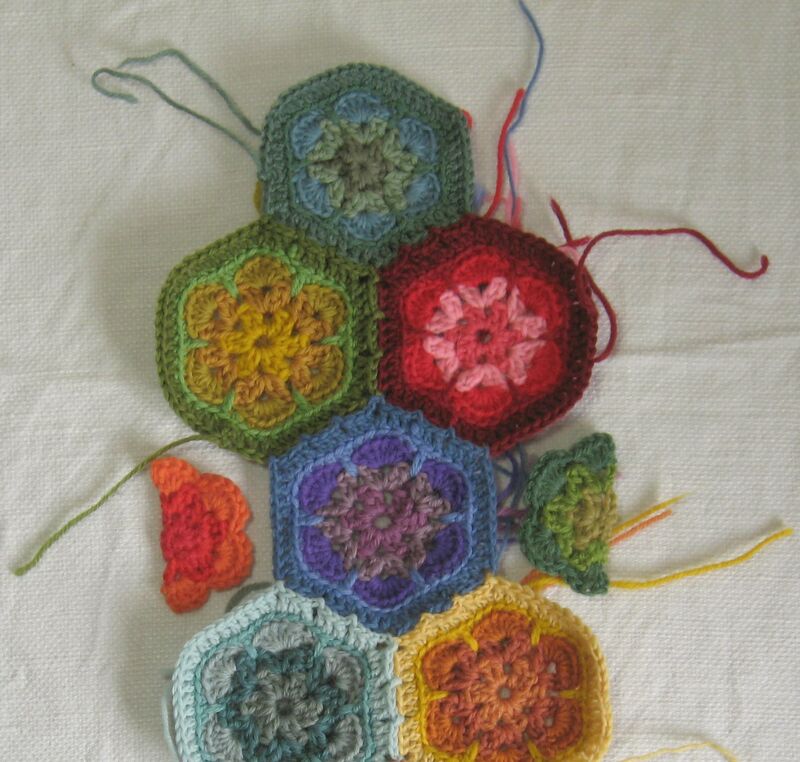 Continue working along a series of loops around the edge of the hexagons…. 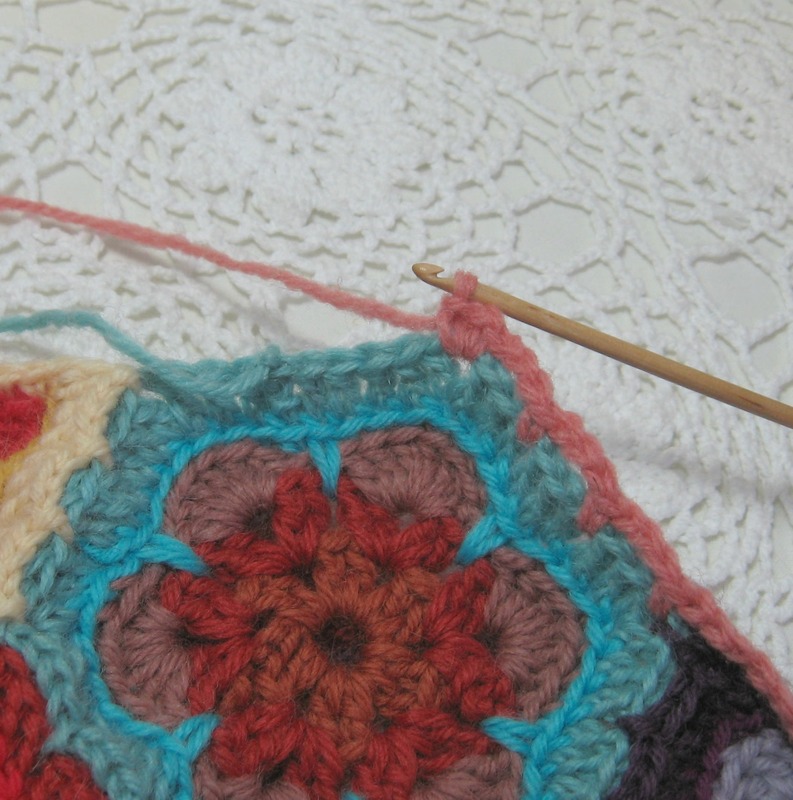 When you come back to the beginning again, make a single crochet stitch and then chain one before slip stitching into where you started……. 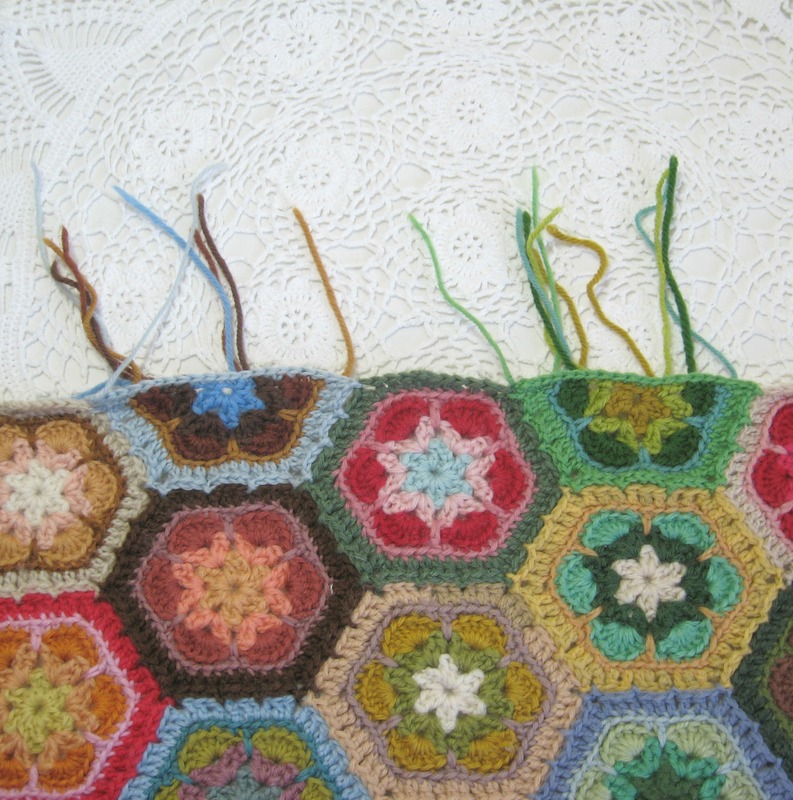 Now chain up 3 and work a double crochet stitch under that corner gap…..chain 2 (2 chains helps the corner be a bit more defined and pointed) and then work another 2 double crochet stitches in that corner gap…..
Work sets of 3 double crochet stitches under the loops of 3, then when you reach the half hexagons, make groups of 2 double crochet stitches……. 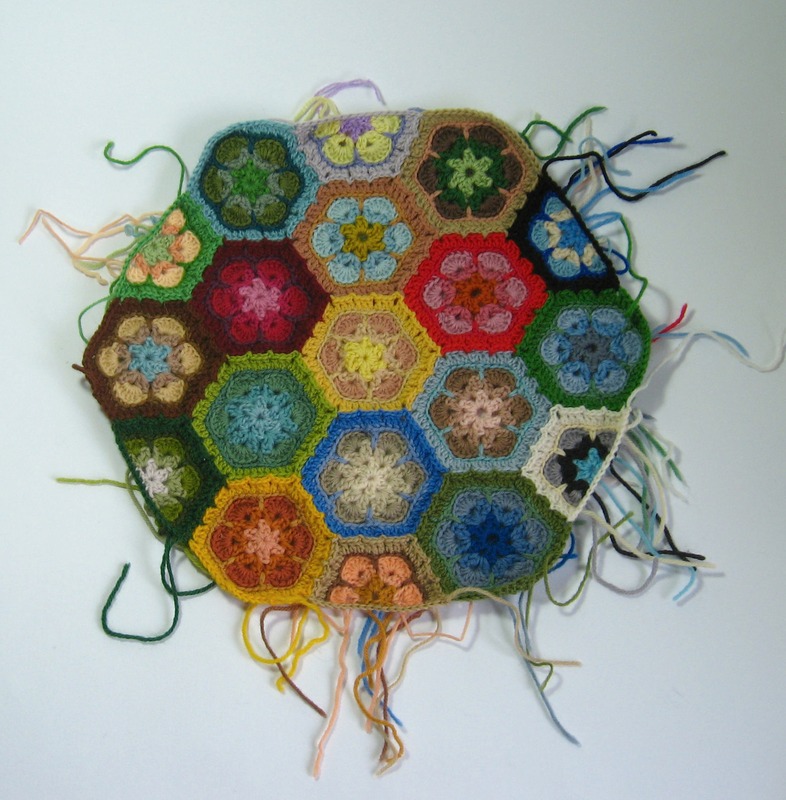 I have tried working straight into the hexagons rather than make the chained loops, but I found it didn’t look quite as neat. 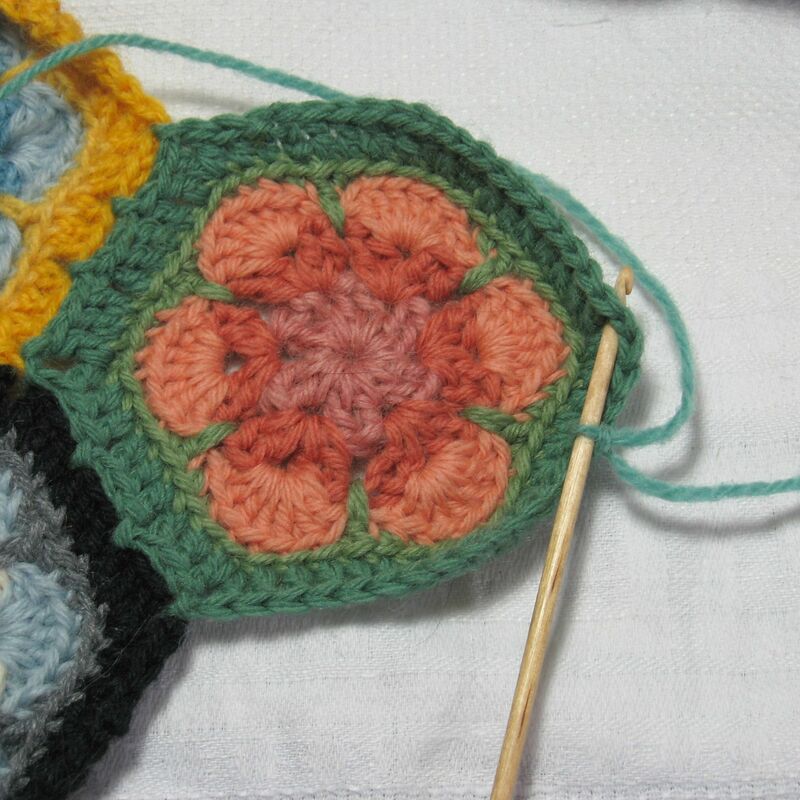 When you get to the corner gap, make 2 double crochet stitches in the gap, chain 2 and then make another 2 gaps before working along the next side. 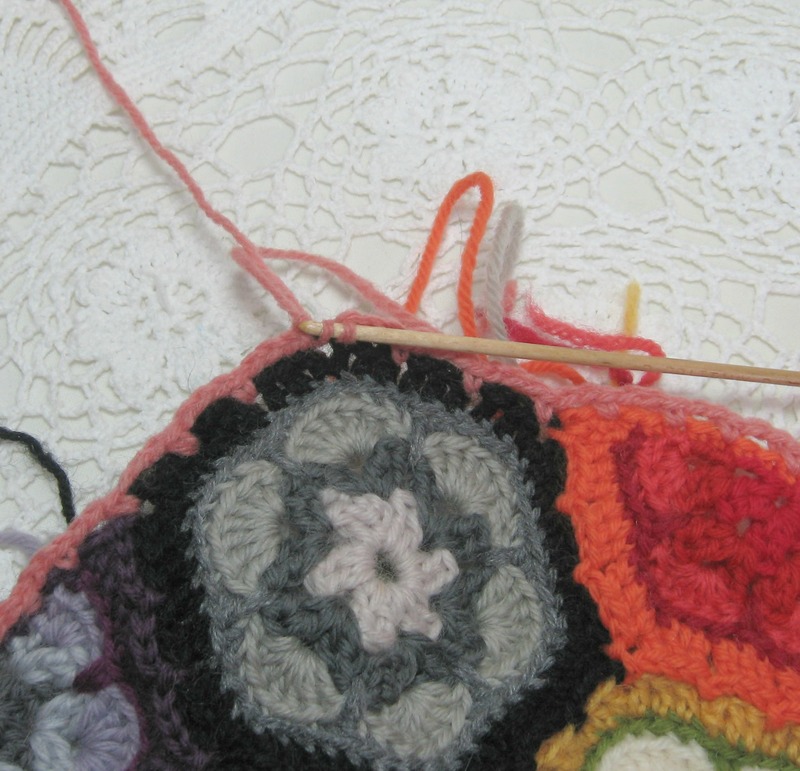 Work all the stitches underneath the loops of the chained loops….. 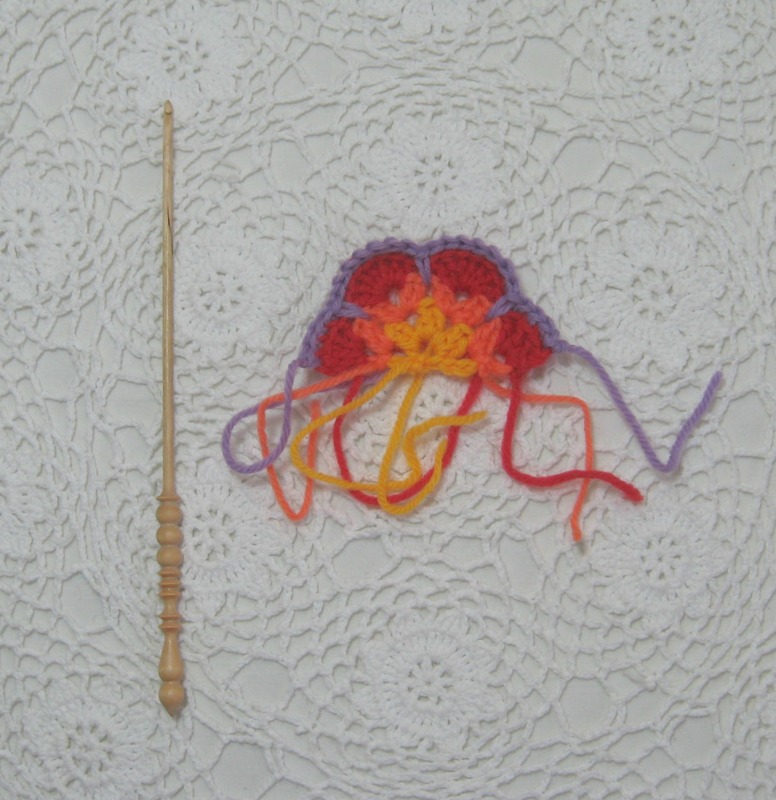 When you reach where you started, make your final double crochet stitch, and then slip stitch into the top of the chain of your starting chain before casting off. 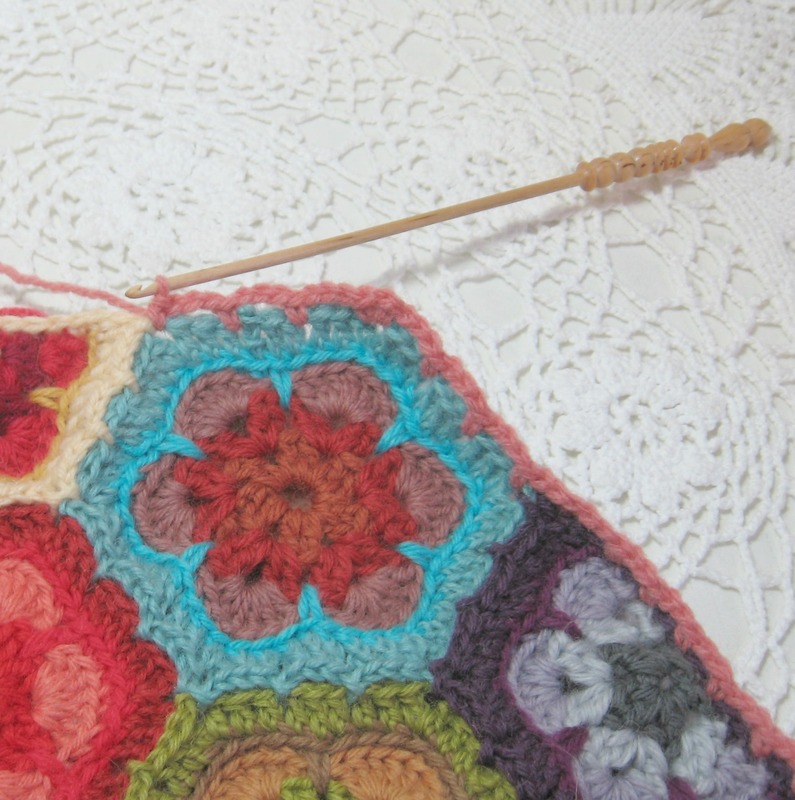 At this stage the edging may well curl in slightly, that’s fine…..you can gently hand wash it and block it so it flattens out if you like, or you can join it to the back section as it is……I won’t send round the crochet police or anything. 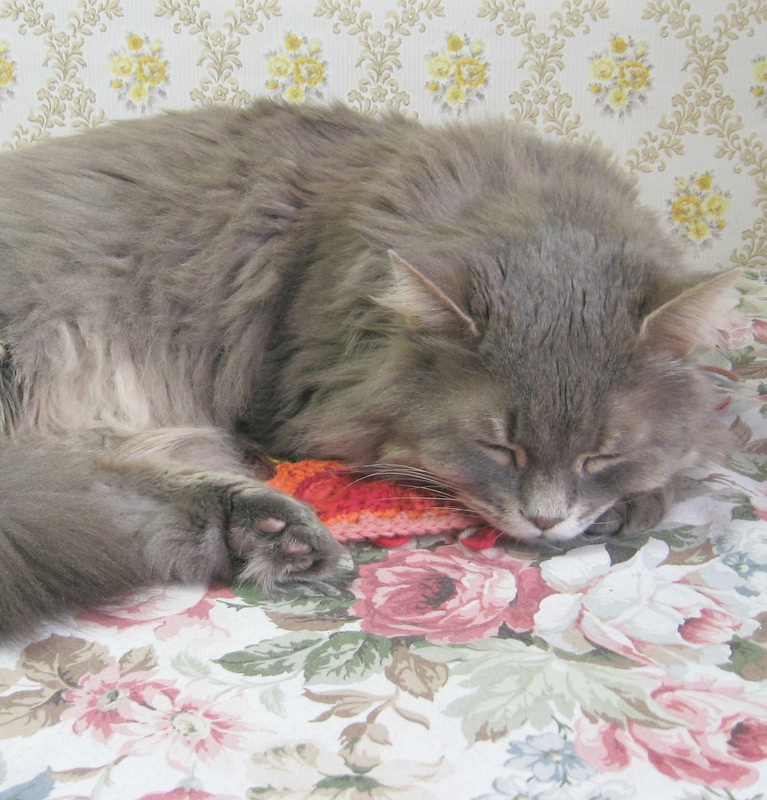 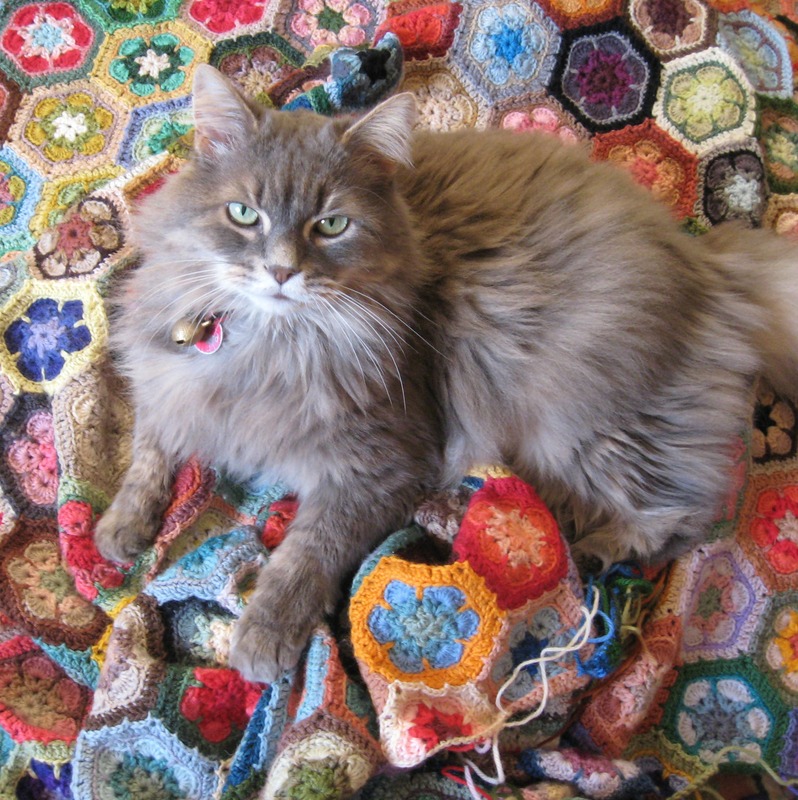 After I’d finished the edging, I nipped downstairs to make a pot of tea…and as if by magic, I came back to find Bernard had sneaked upstairs and had stolen my crochet……he’d settled himself down and made a little nest……I’ve never known a kitty so fond of knitting and crochet, the other day while I was trying to sort out some old acrylic granny squares I’d made a couple of years ago, he clambered up on the sofa and nestled amongst them, even when I’d tried to tidy them up in a knitting bag he then proceeded to wedge himself in said bag and made himself very cosy. 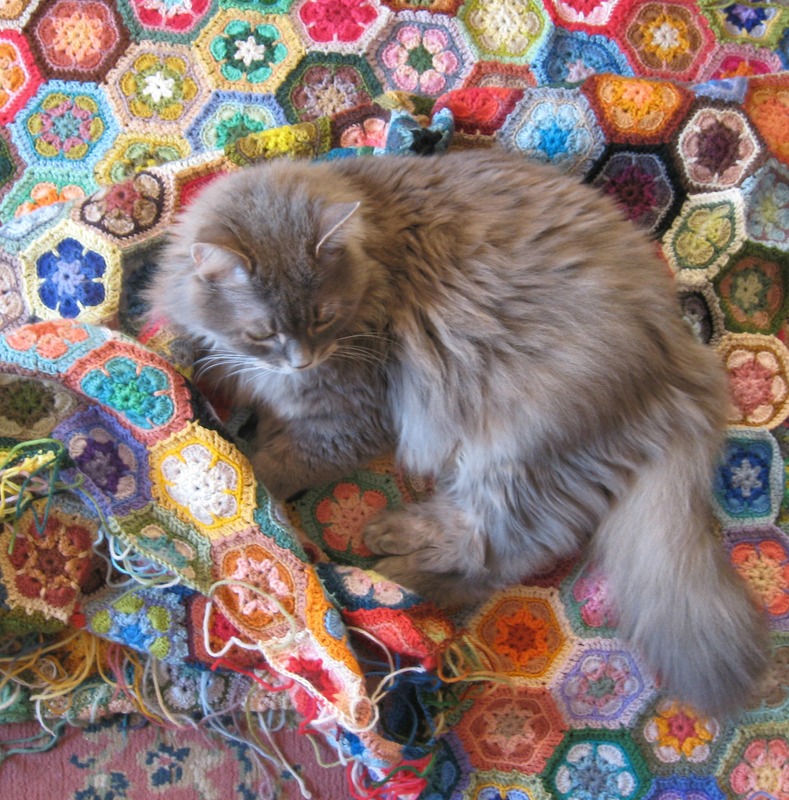 He’s trying to look all cute and innocent because he’s been all bitey and scratchy, trying to stop me from taking the crochet back….he even uses his secret weapon (a bout of trumpety wind) to make me keep my distance…..but right now he’s so purry and paw wiggley….I dread to think what he’ll be like once the cushions are all made and plumped up on the sofa. 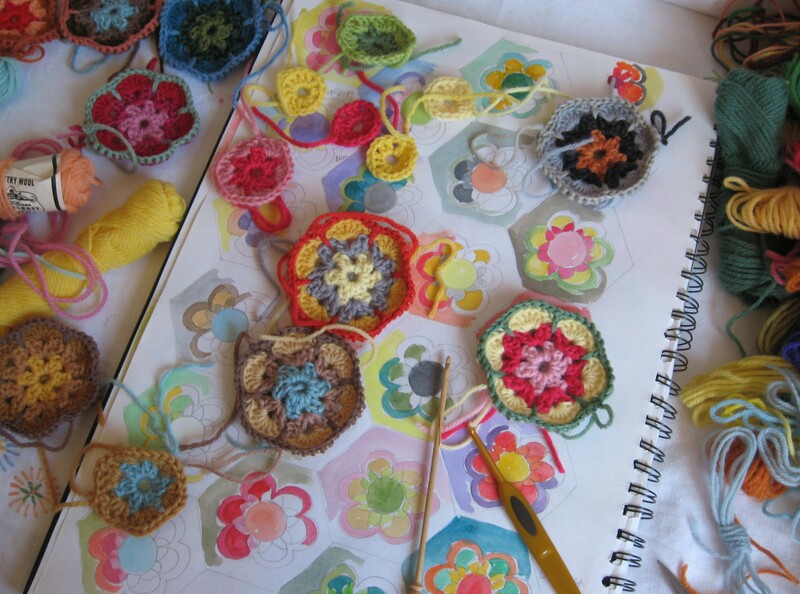 Millefiori for the sofa or a grannies paperweight crochet cushion……. 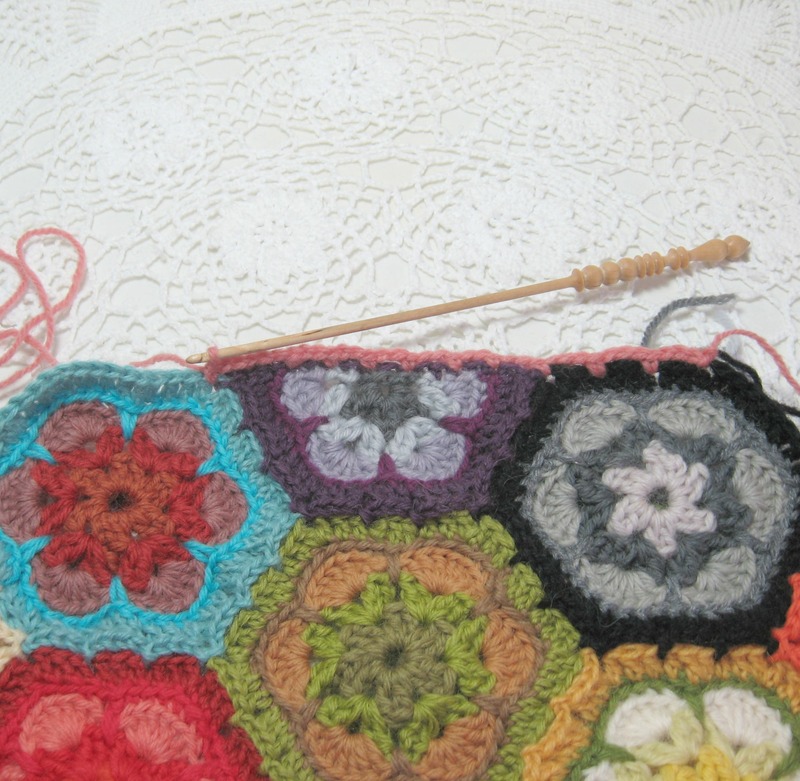 Even though I still have hundreds (and hundreds) of woolly tails to sew in on both my blanket and scarf, I’m afraid I’ve started yet another project using the lovely grannies paperweight crochet pattern…..this time it’s a cushion (actually a pair of them as I thought they’d look nicer on our sofa as a pair)…..as I’ve mentioned before, I love this pattern so much, it looks just like those beautiful millefliori glass paperweights or fair-rock sweets from the seventies. 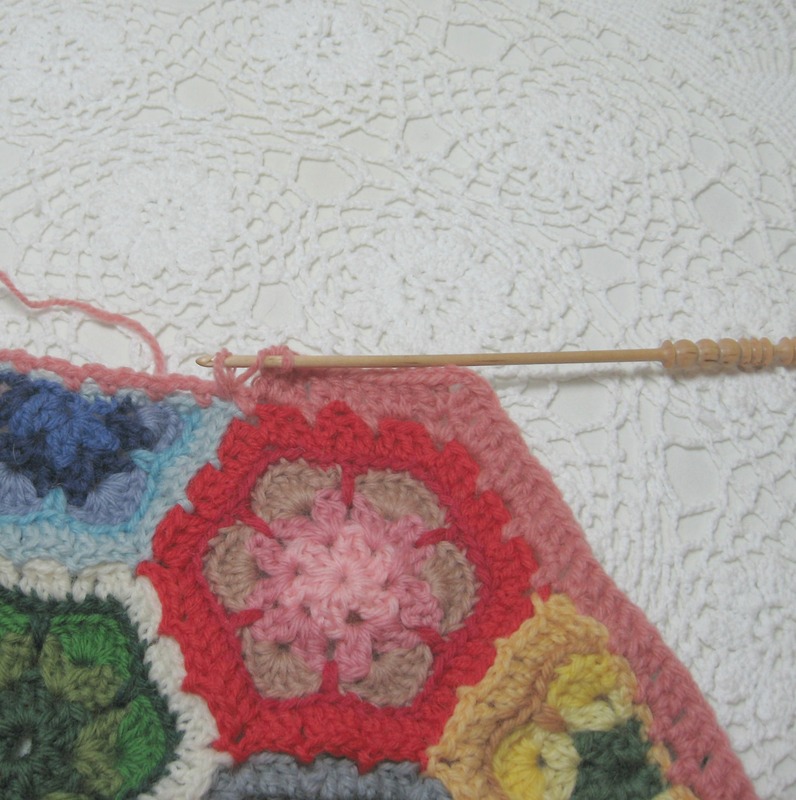 Like the blanket and scarf, I’ve used tapestry wool as I find the colours blend so well, and also the colour choice is much wider than acrylic yarn. 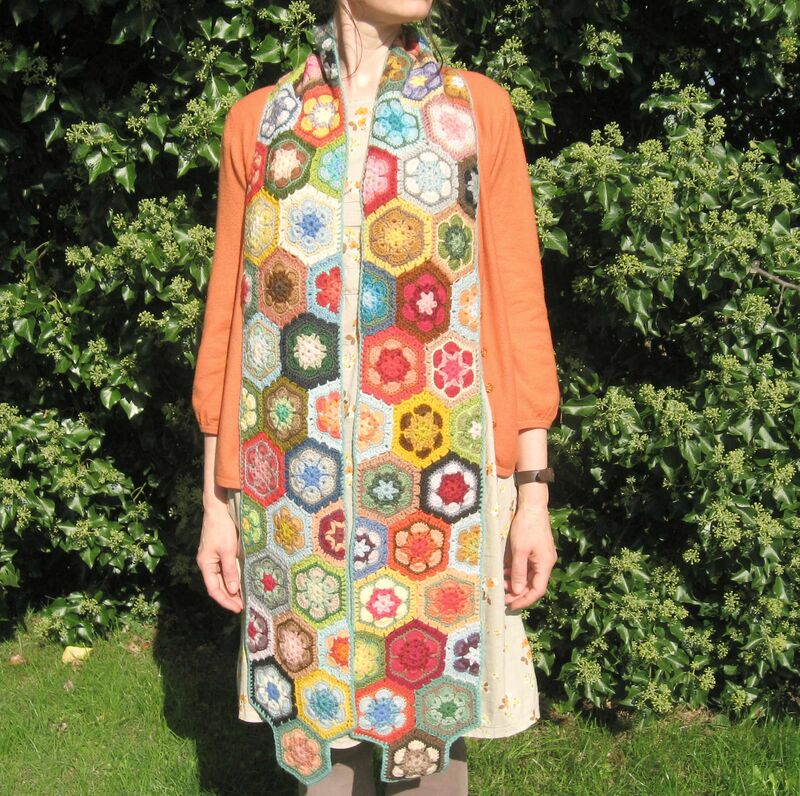 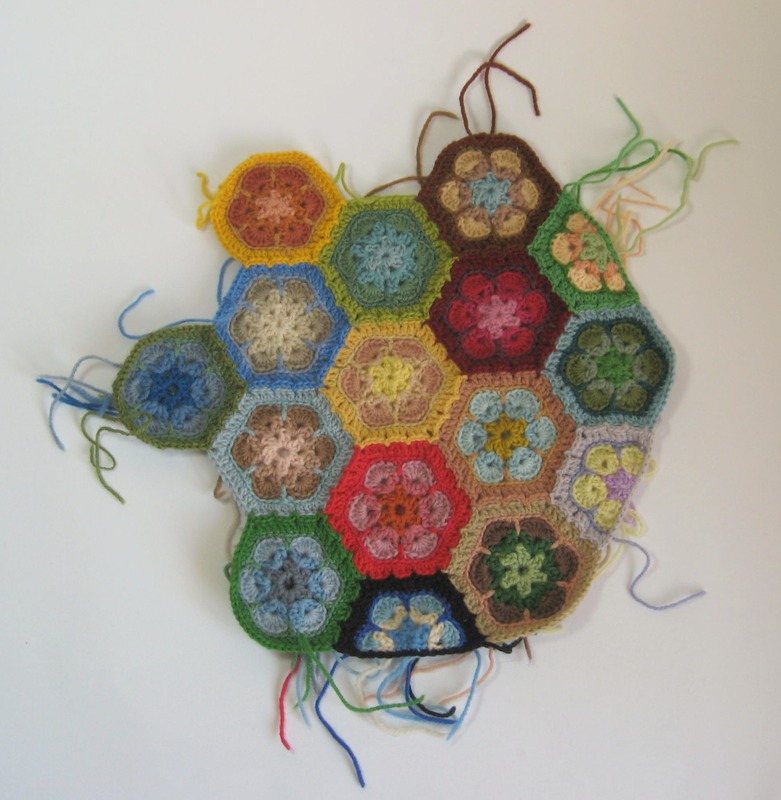 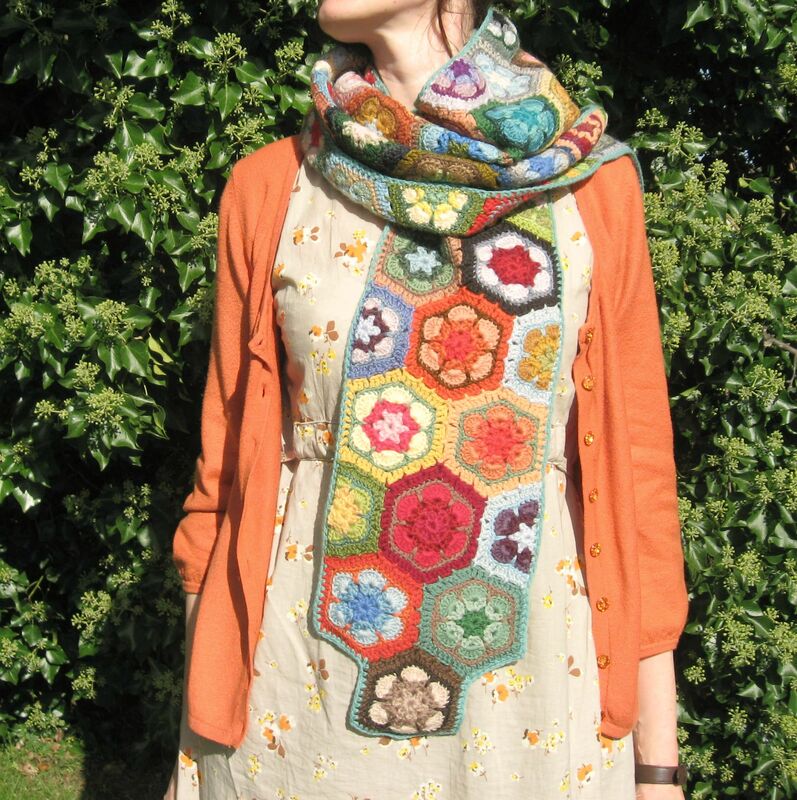 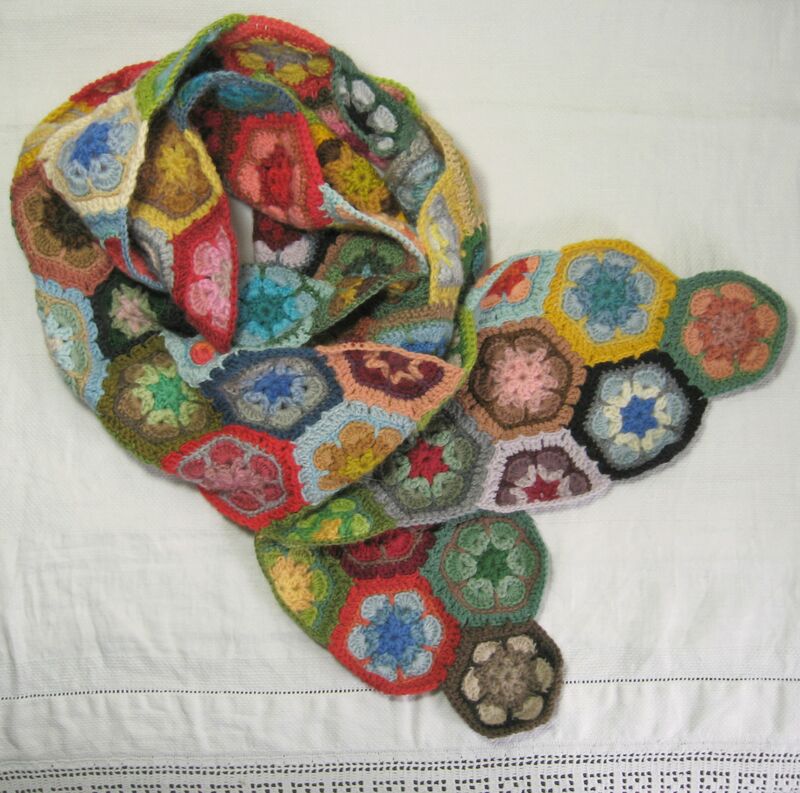 For the best tutorial on making and joining the hexagons I would recommend using the one on Heidi Bears blog, if you can crochet a basic granny square then you can crochet these….just have a pot of tea and some biscuits close to hand and you’ll be fine. 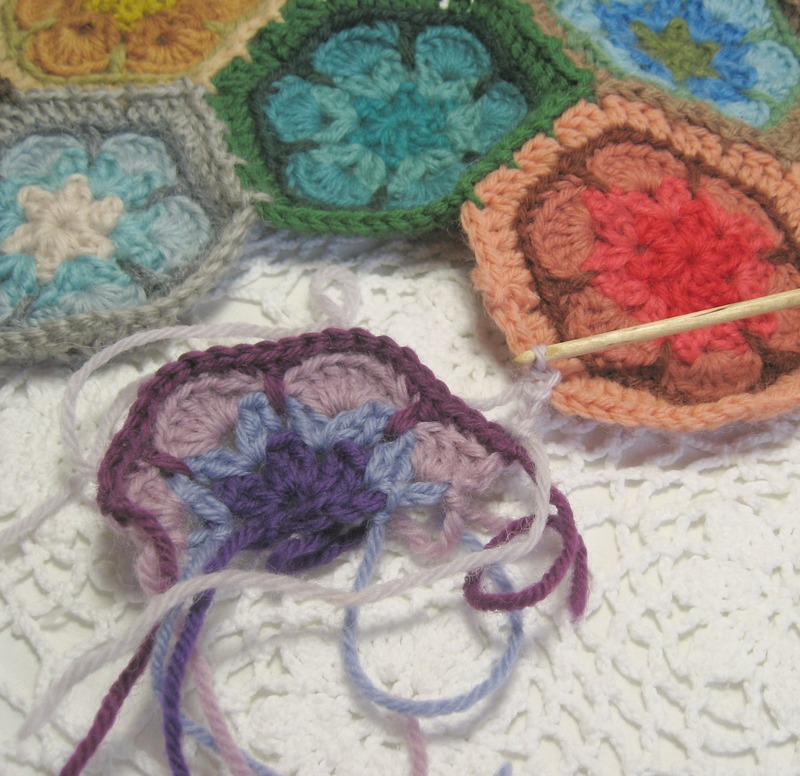 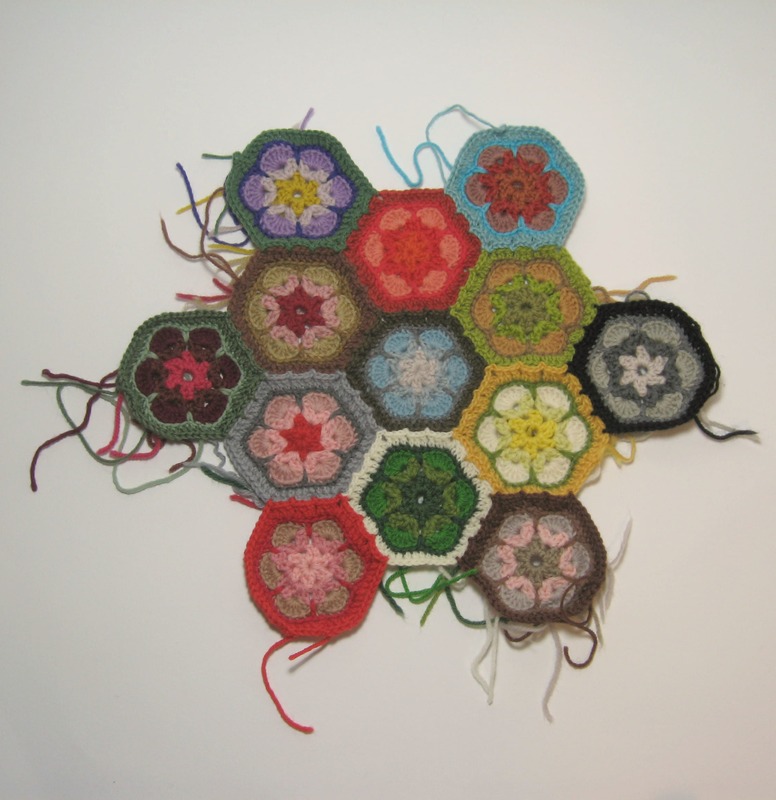 Start off by making and then joining together 7 hexagon flowers (I like mine to join together on the 5th round as I find that size gives a good density of colour). 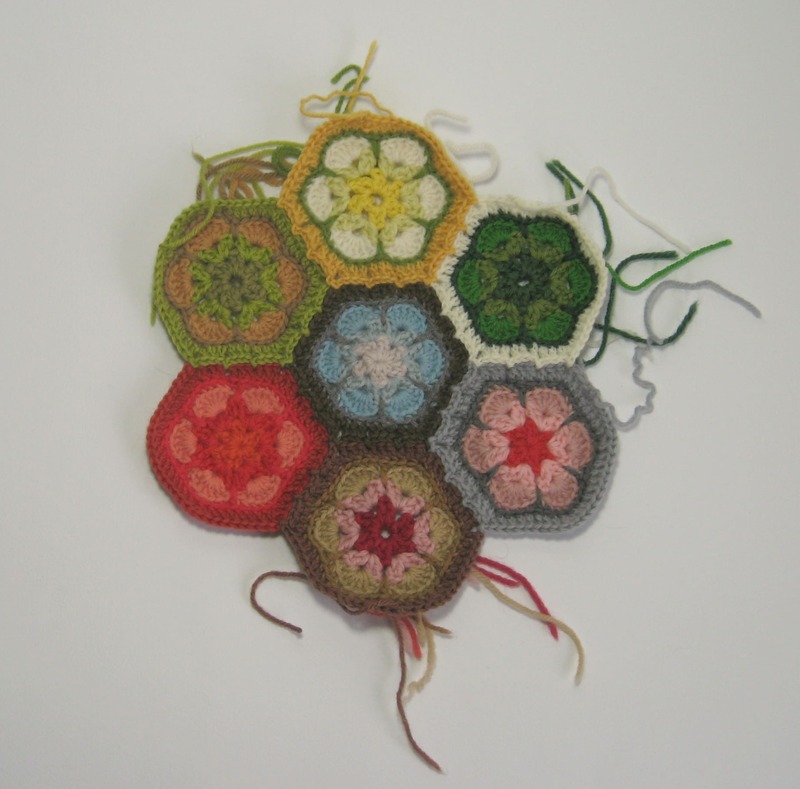 Next you will need to make 6 half hexagons (this is the way I prefer to make mine, and this is how I join them in)…again they join in on the 5th round. 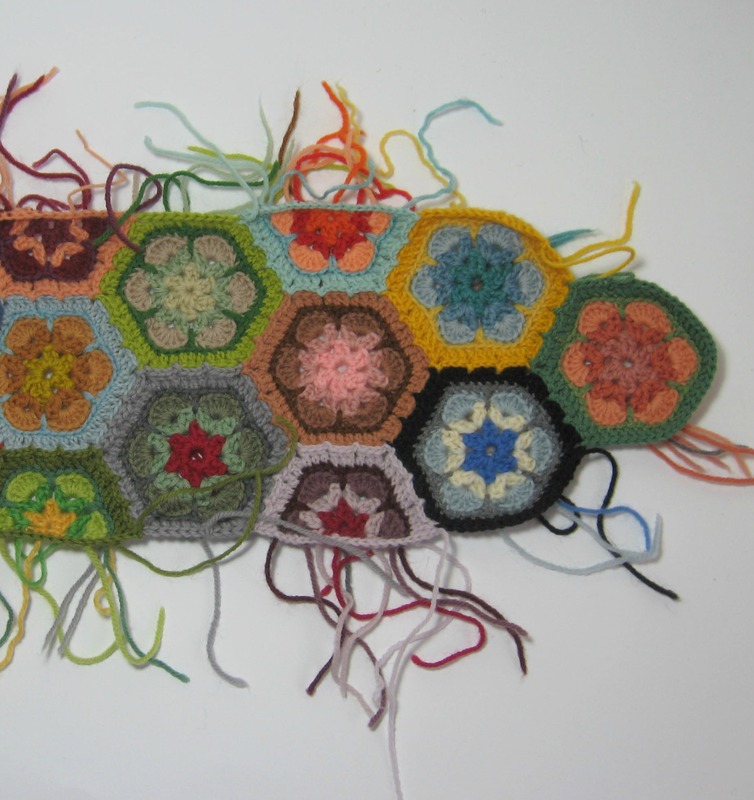 I’ve found when I work the chains in to the raw edge to neaten off the hexagon side, it can vary how many chains I make…I think it depends somewhat on the thickness of the various wools I have used to make the half hexagon, and generally it ranges between 16-18 chains. 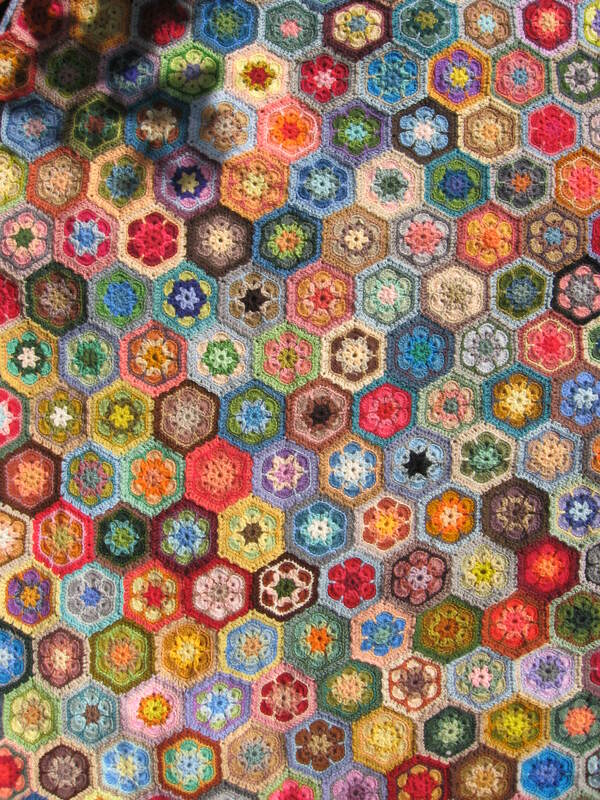 And this is what your millefiori cushion will look like once all the half hexagons have been joined into place…..
And this is the second cushion….I really couldn’t help myself and had to make two…..originally I had thought to make both sides of the cushion using the millefiori/grannies paperweight pattern, but then I thought about using vintage blanket fabric for the back as I figured that would make removing the cushion insert easier and I’d be able to launder the cover where necessary. 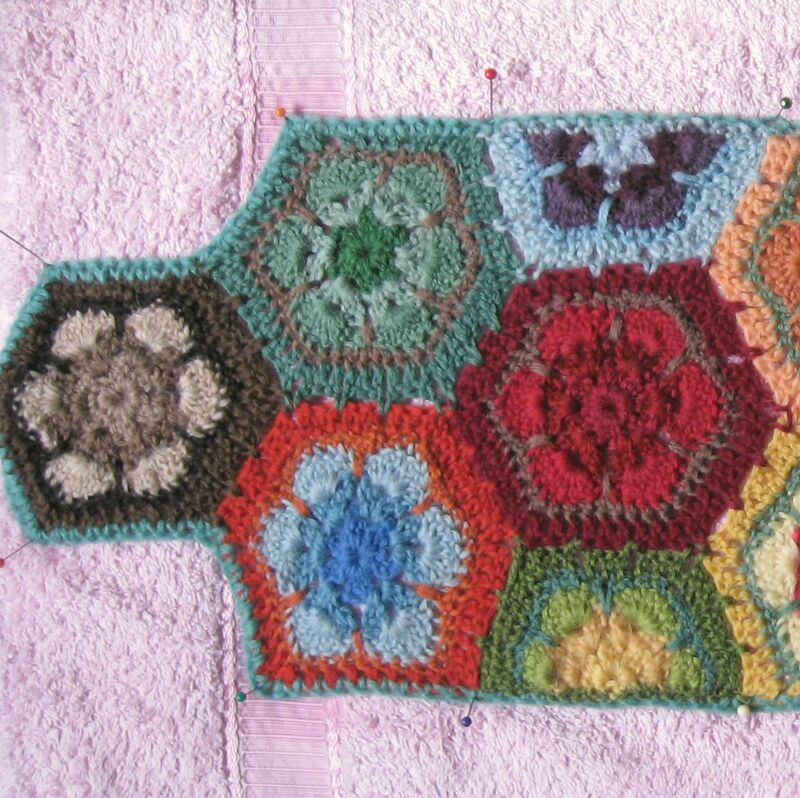 At this stage if you want to, you can sew in some of the tails, though try to avoid sewing in the final tail of the outside round of the hexagons that form the edges (it just makes working into those sections later a bit harder) however, as the tails won’t be on show (like with a blanket or scarf) it isn’t really all that necessary.